One of the things I like about this time of year is how you can see so much further into the forest once the shrubs that make up the undergrowth have lost their leaves. 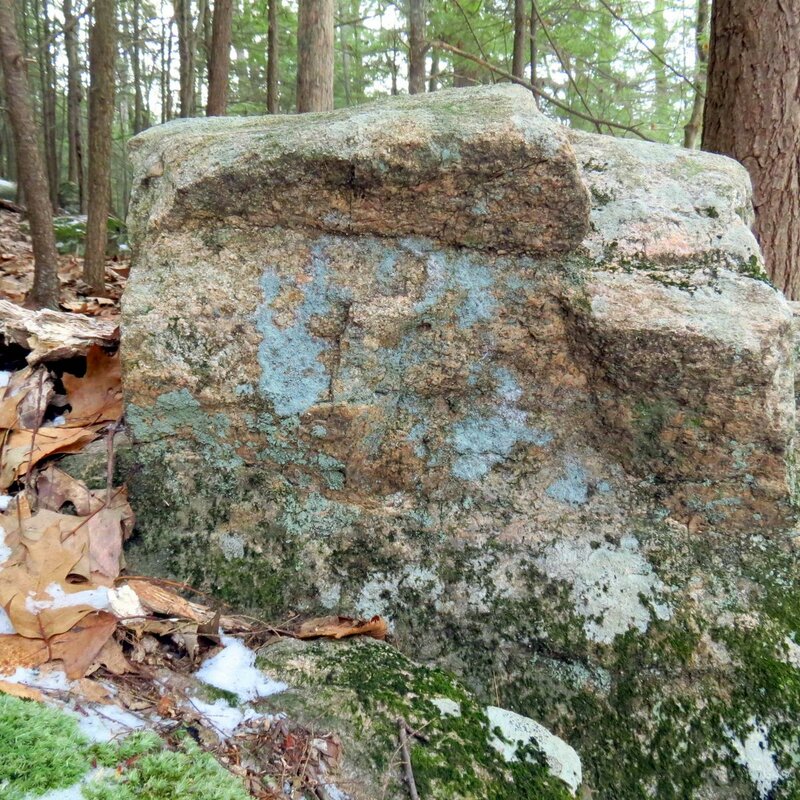 This means that things that were hidden all summer like mosses suddenly become very visible. 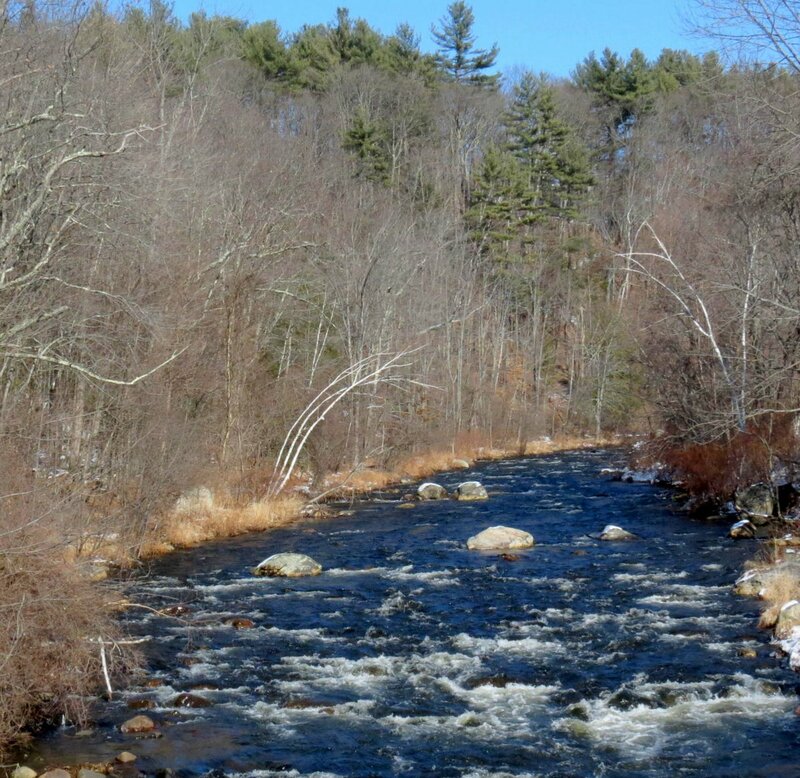 I was surprised to find that I could see so far up Brickyard Brook in Winchester recently. 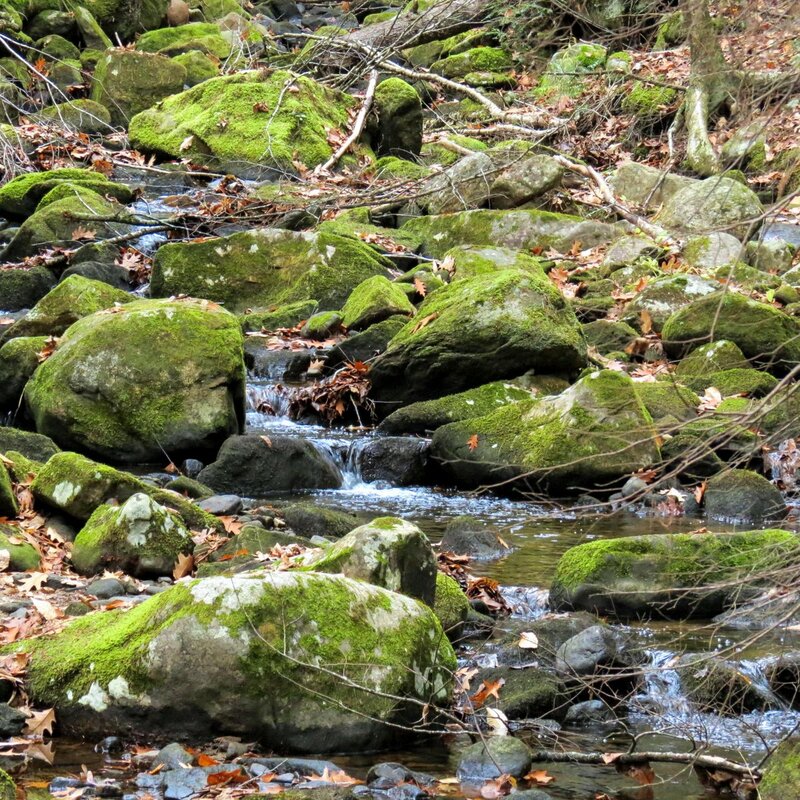 The water was very low and every stone was covered in moss. This is odd since not that long ago water covered most of the stones. Can mosses really grow that fast, or were they there underwater the whole time, I wondered. 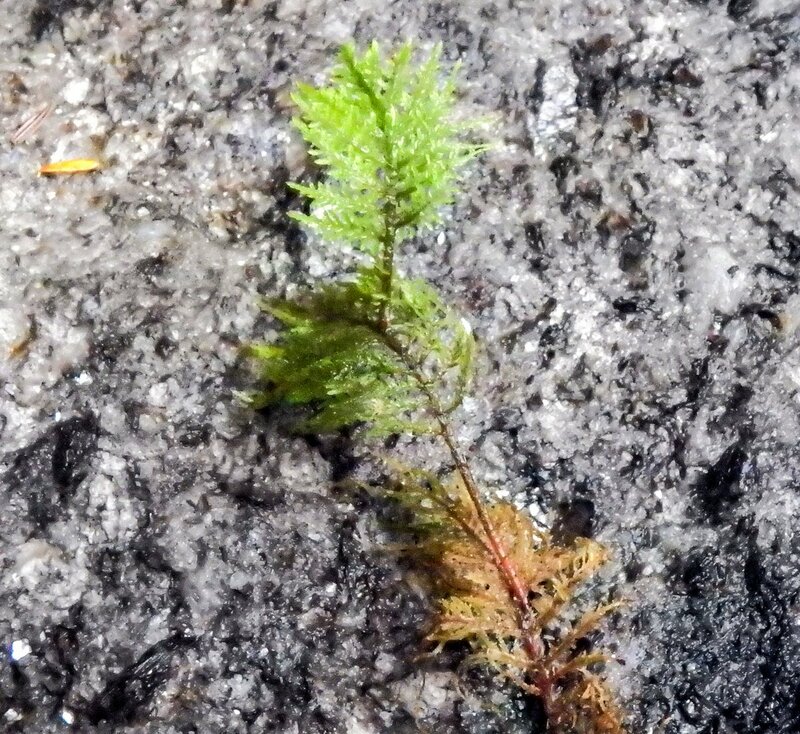 There are aquatic mosses and one called common water moss (Fontinalis antipyretica) was recently found to be growing at 1000 foot depths in Yellowstone Lake, near a geo-thermal vent. The name medusa moss (Hedwigia ciliata) comes from the way this moss looks like a bunch of tangled worms when it dries out. 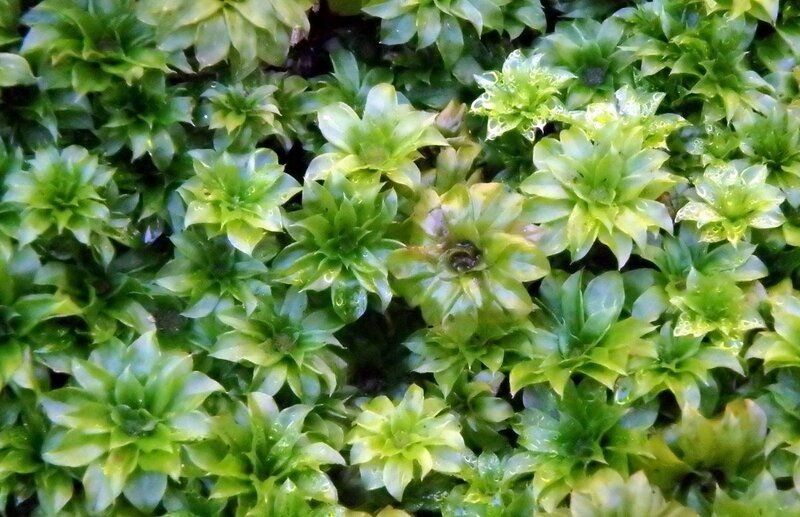 It is also called white tipped moss, for obvious reasons. 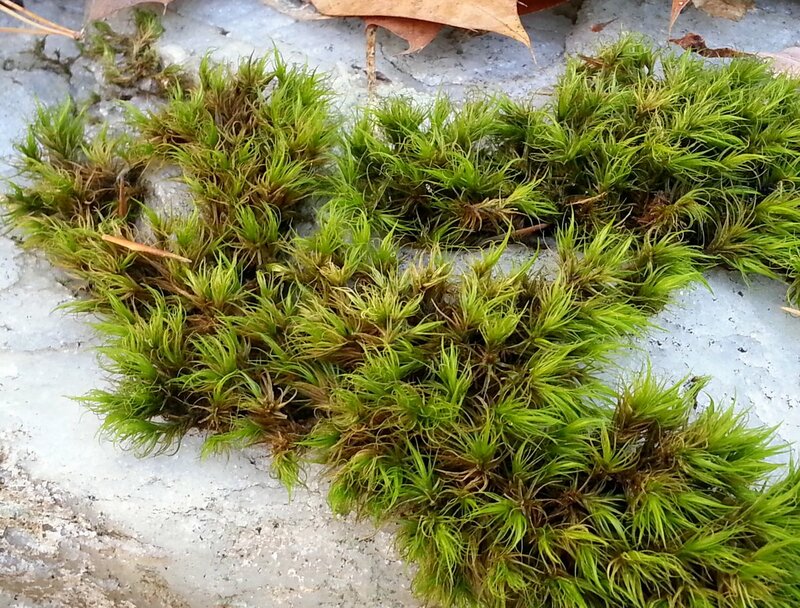 This moss is fairly common and I find it mostly growing on stones in sunny spots. It always seems to be very happy and healthy. 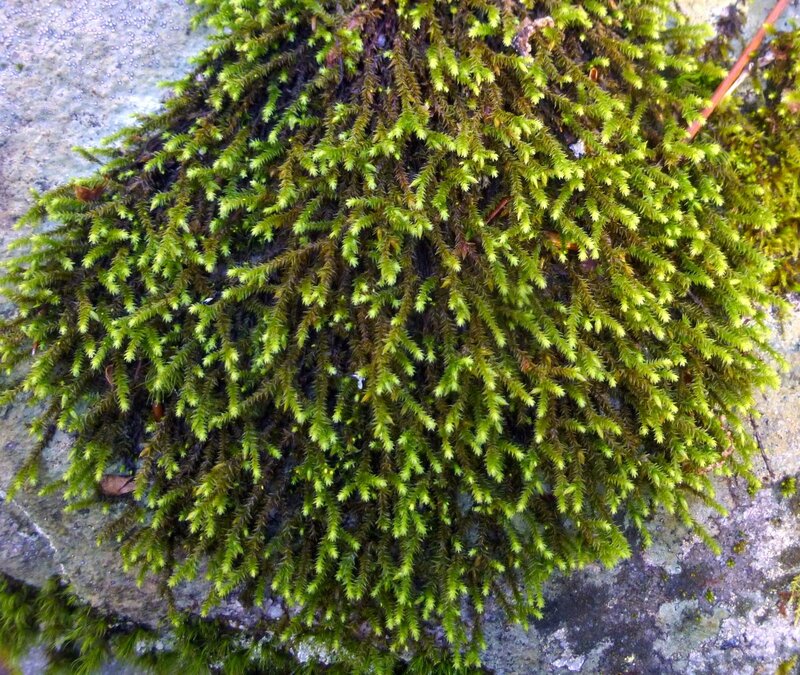 The main stems of rambling tail-moss are said to be creeping with blunt ends like a paintbrush, and they arch upward when dry like a hook. Those attributes and their yellow green color are what lead me to think that this example is Anomodon viticulosus, but I could be wrong. 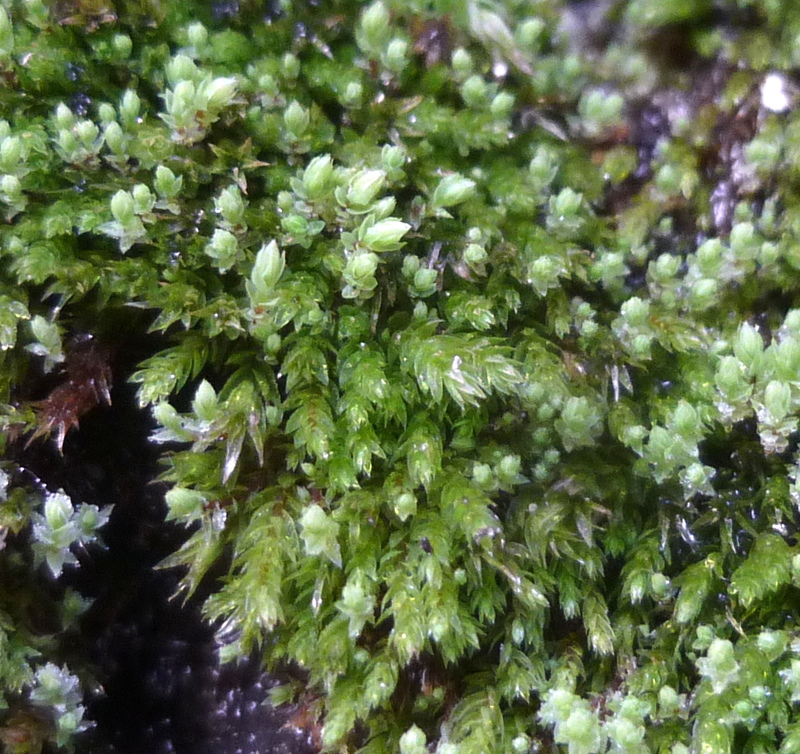 You really need a microscope to be sure when there are several mosses that look so much alike. 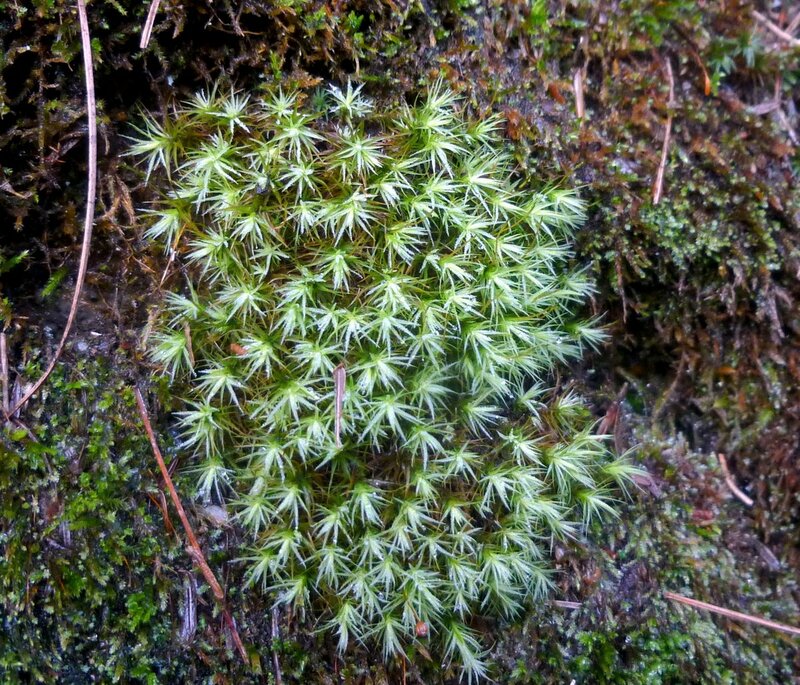 Apple moss (Bartramia pomiformis) doesn’t look like many other mosses so it’s relatively easy to identify. 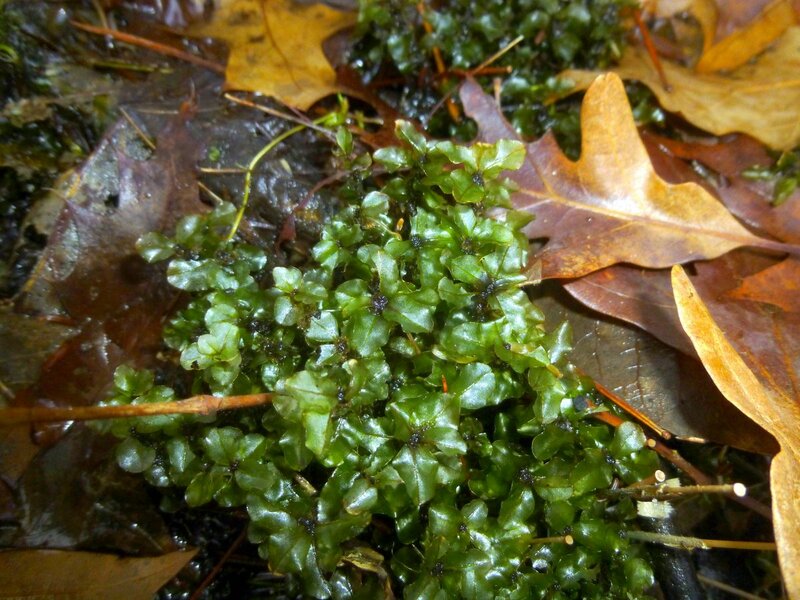 Its reproduction begins in the late fall and immature spore capsules (sporophytes) appear by late winter. 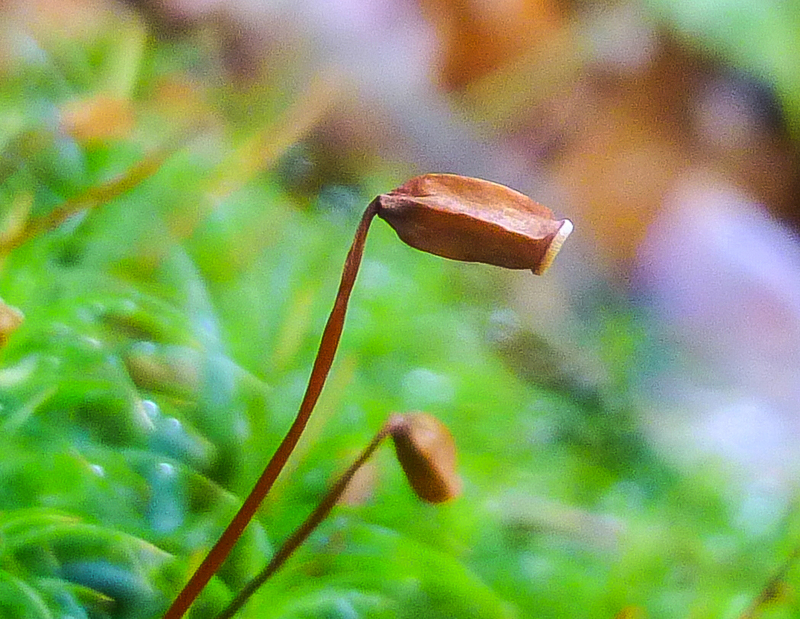 When the warm rains of spring arrive the straight, toothpick like sporophytes swell at their tips and form tiny globes that always look like pearls to me, but someone thought they looked like apples and the name stuck. Though they’re orange on this example sometimes the spore capsules do turn red as they age, so I guess the name apple moss is appropriate. Broom moss (Dicranum scoparium) gets its common name from the way the leaves all point in the same general direction, making it look as if it had been swept by a broom. 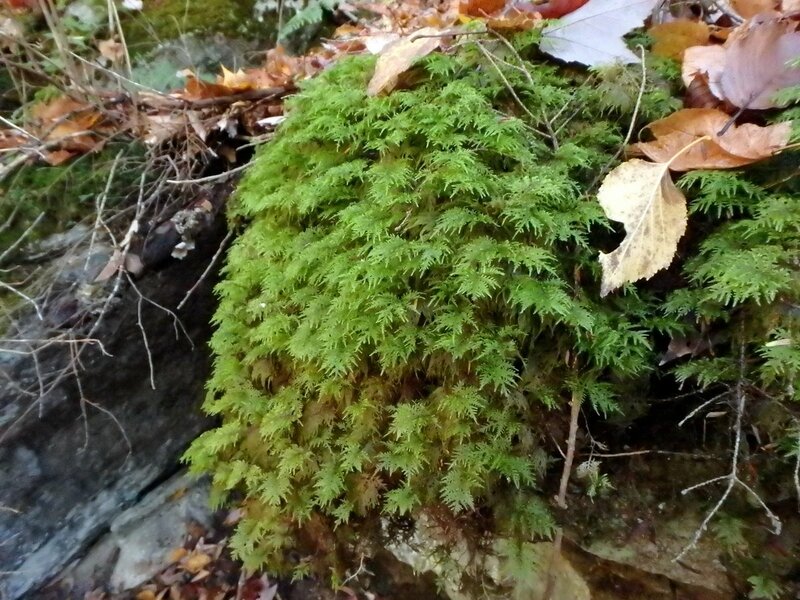 It’s a fairly common moss that grows in large tufts or mats on logs and tree bases, soil or stone. Delicate fern moss (Thuidium delicatulum) changes from deep green to lime green when it gets cold and becomes one of the more visible mosses. It grows in soil in shaded spots and I find it in my lawn each fall. 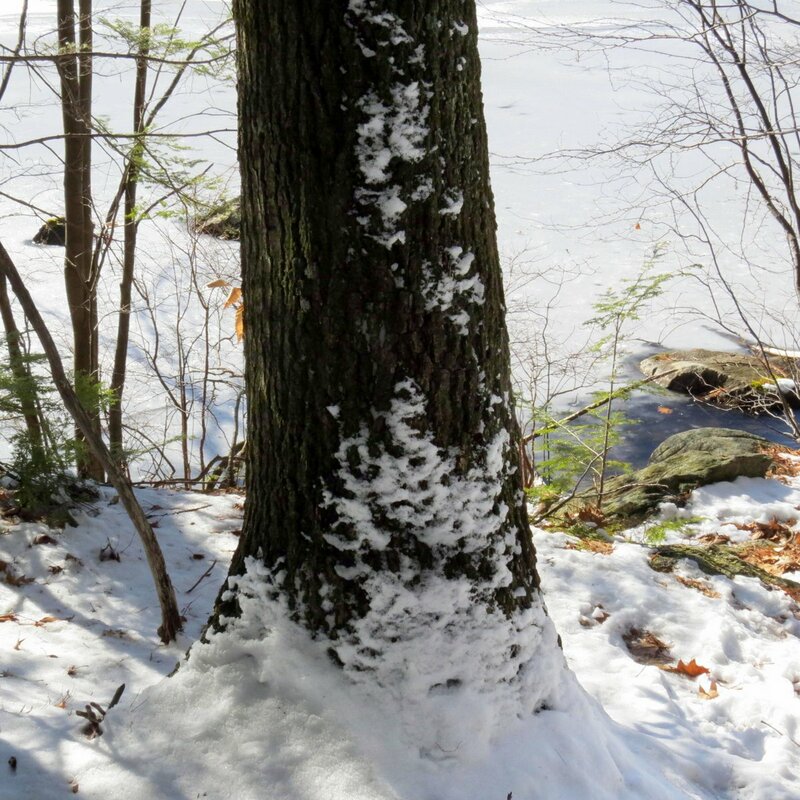 It will also grow on the base of trees and on logs and boulders, where it can form quite dense mats. Orchid growers use this moss in orchid cultivation. 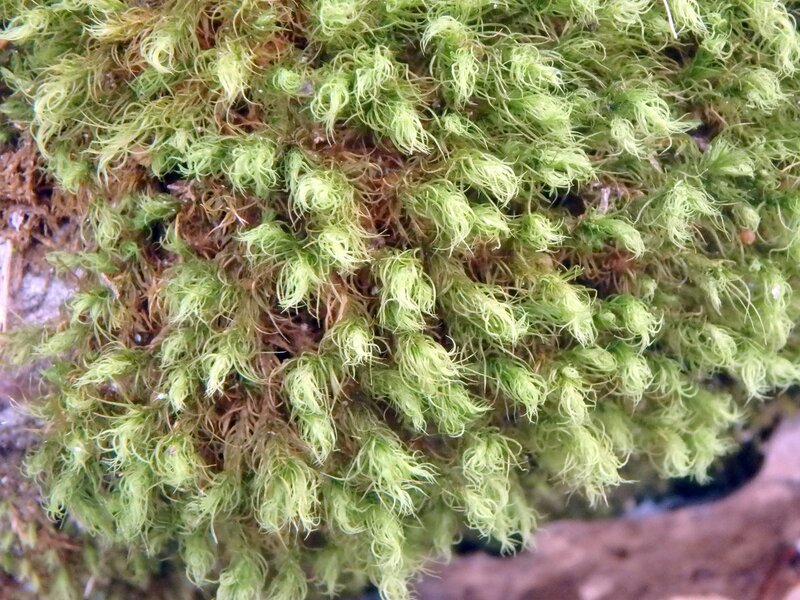 Stair-step moss (Hylocomium splendens) is a very beautiful moss that grows on stones and looks quite fragile, but I’ve seen it with icicles hanging from it so I can say with certainty that it’s a lot tougher than it looks. That is most likely why it grows as far north as the arctic tundra. It seems fairly rare here; this is the only place that I’ve seen it. When dry stair step moss has a slight satiny sheen to it, and that’s probably how it came by its other common name of glittering wood-moss. 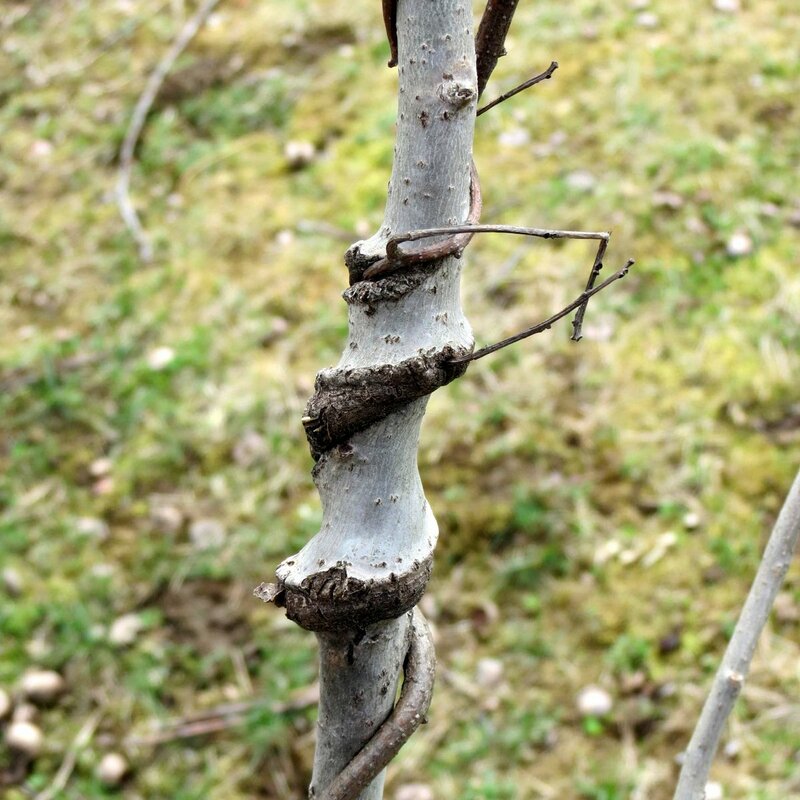 Its common name comes from the way the new growth “steps up” off the midrib of the previous year’s branch. Each year a new branch grows from the old and this growth habit allows stair step moss to grow up and over other mosses. It is said that you can tell the age of the moss by counting these steps, and from what I saw this branch would have been at least 5 years old. 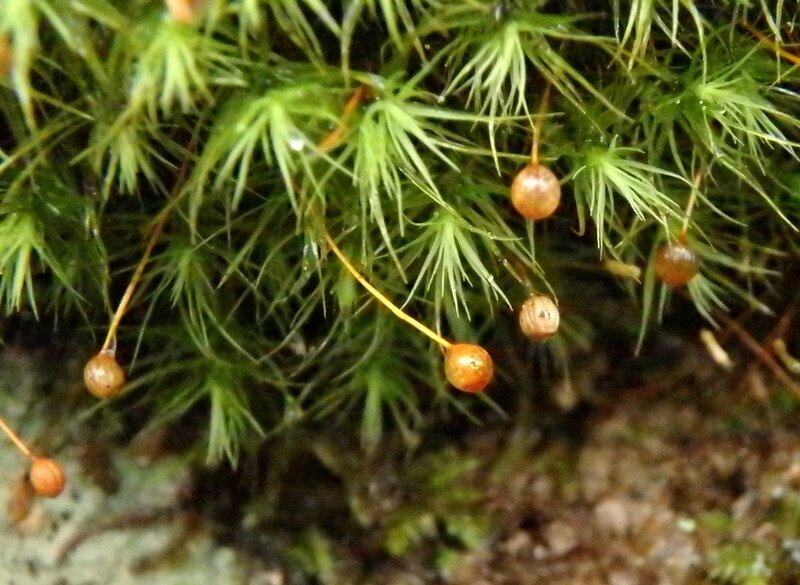 This is the first time that big red stem moss (Pleurozium schreberi) has appeared on this blog because, though I’ve seen it for years I have only just learned its name. 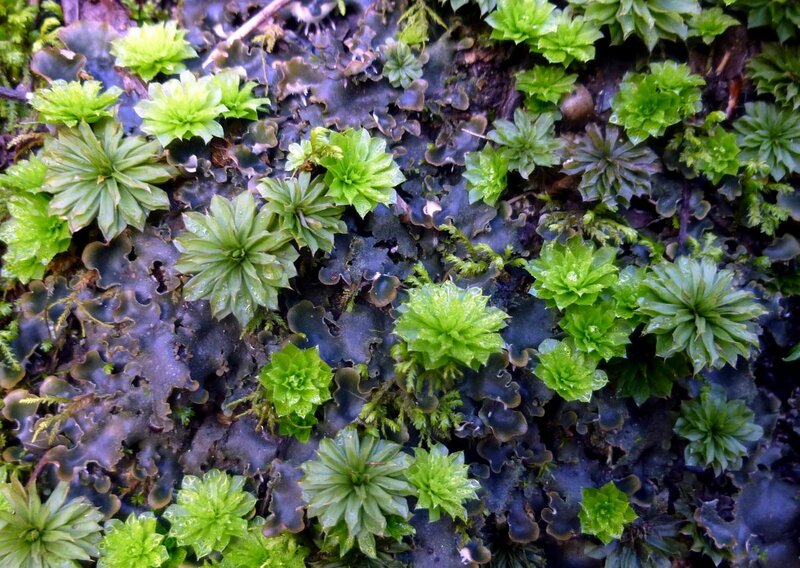 It’s a very common moss that I often see growing in very large mats, sometimes even overrunning other mosses. 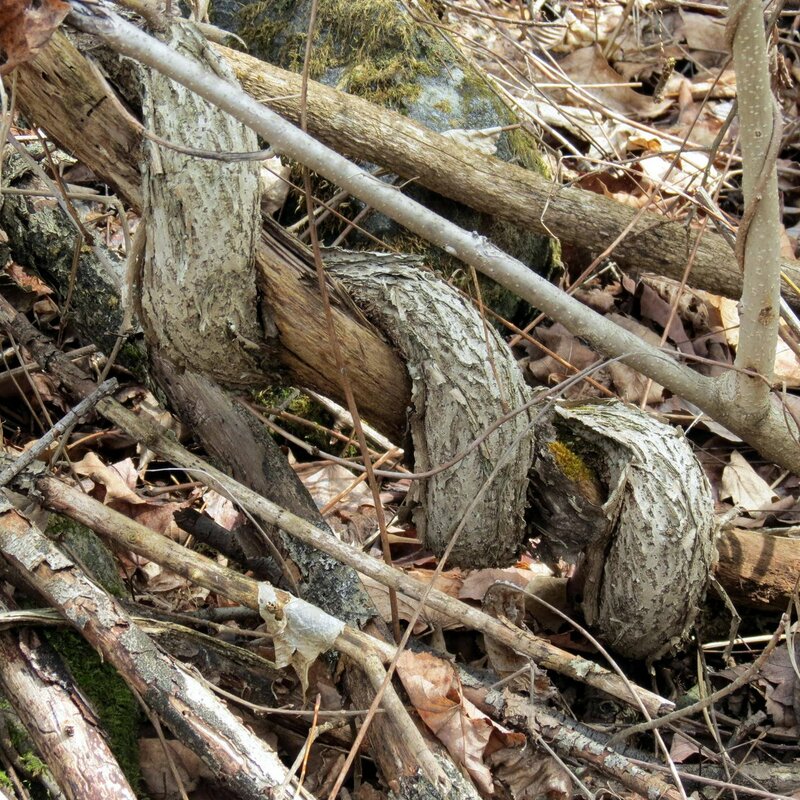 I finally learned the name of this one by reading The Saratoga Woods and Waterways Blog. 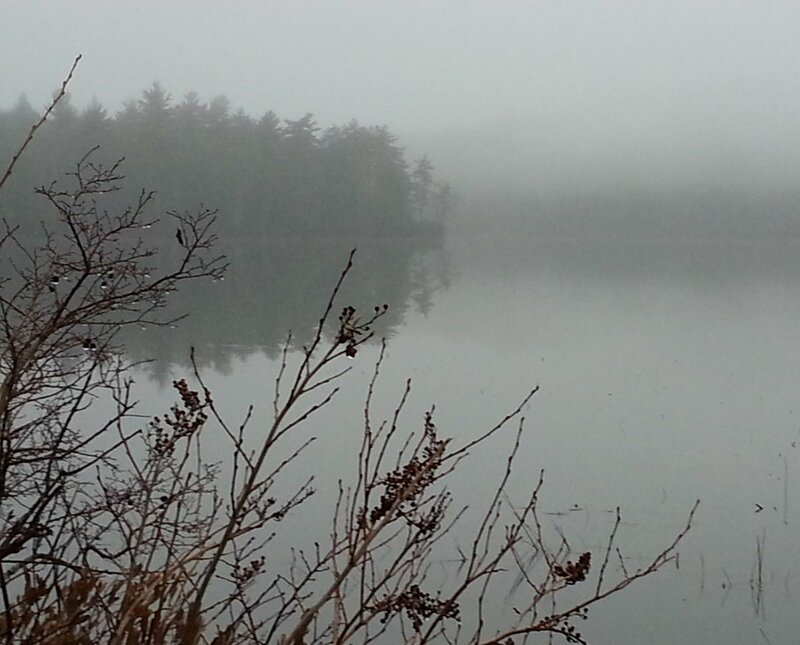 If you love nature and aren’t reading this blog you’re doing yourself a disservice. It should be obvious how big red stem comes by its common name but I don’t see any red, and neither does my color finding software. I’ve looked through two moss books and countless photos on line though, and all examples of big red stem look like this example. That makes me wonder if its stem isn’t red for part of the time. 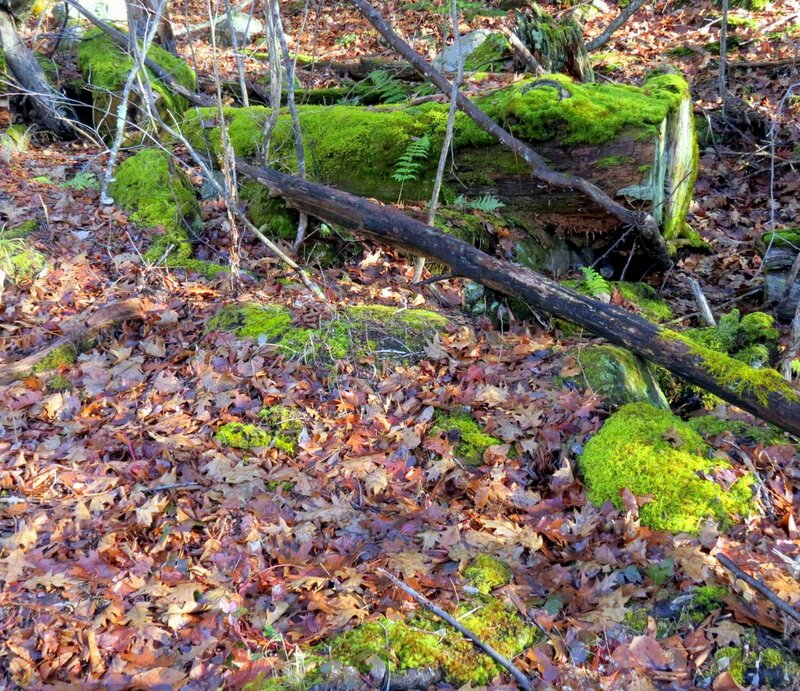 Mosses do change color. 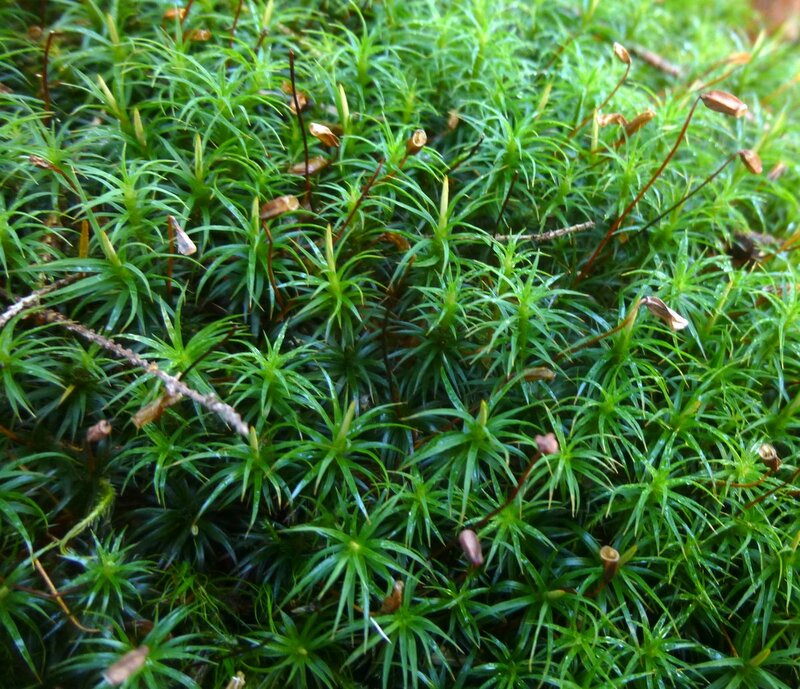 Rose moss (Rhodobryum roseum) is a very beautiful moss and one of my favorites. Each little rosette of leaves looks like a tiny flower, and that’s how it comes by its common name. Rose moss is a good indicator of limestone in the soil so it’s wise to look for other lime loving plants in the area when it is found. 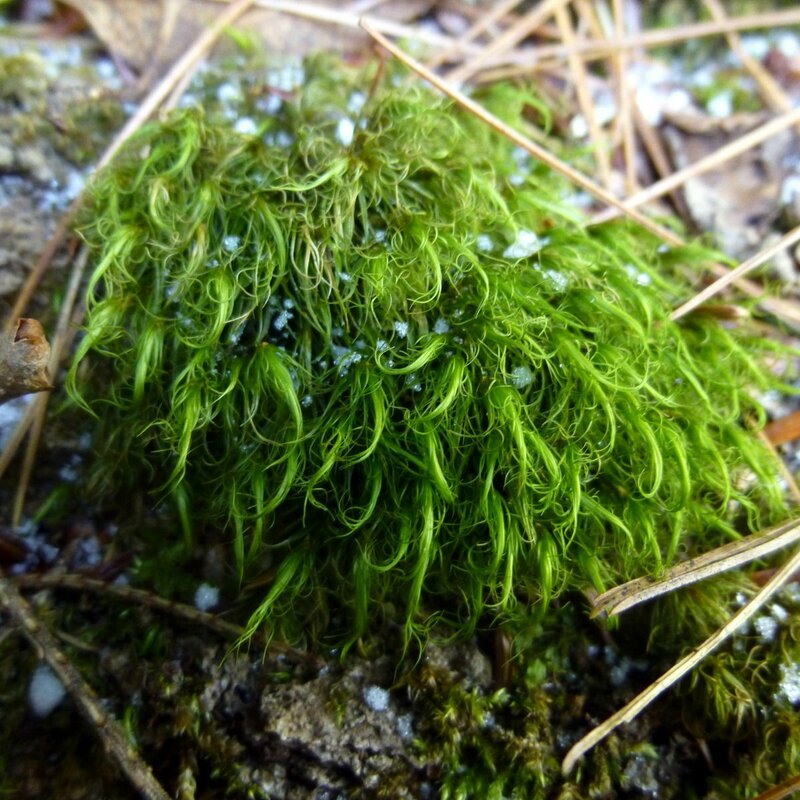 This is a relatively rare moss in my experience. I know of only one place to find it. Moss grows where nothing else can grow. It grows on bricks. 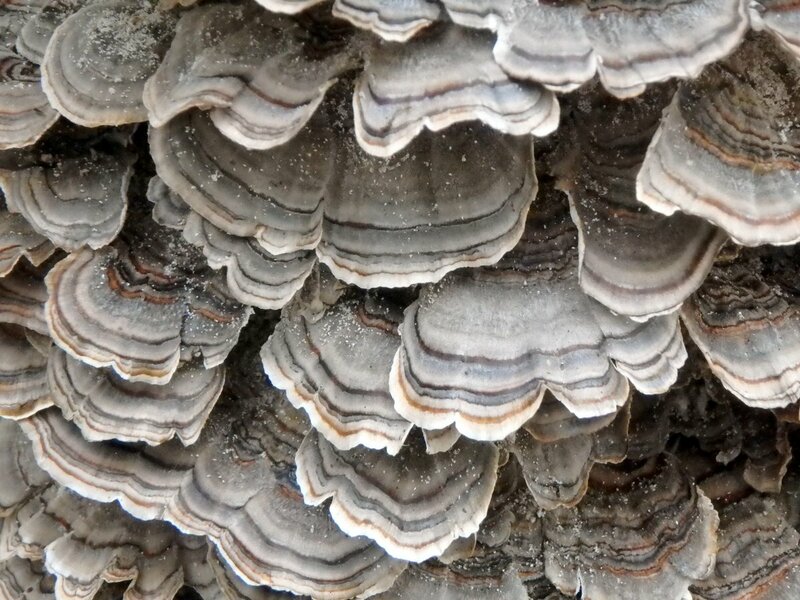 It grows on tree bark and roofing slate. It grows in the Arctic Circle and in the balmiest tropics; it also grows on the fur of sloths, on the backs of snails, on decaying human bones. It is a resurrection engine. 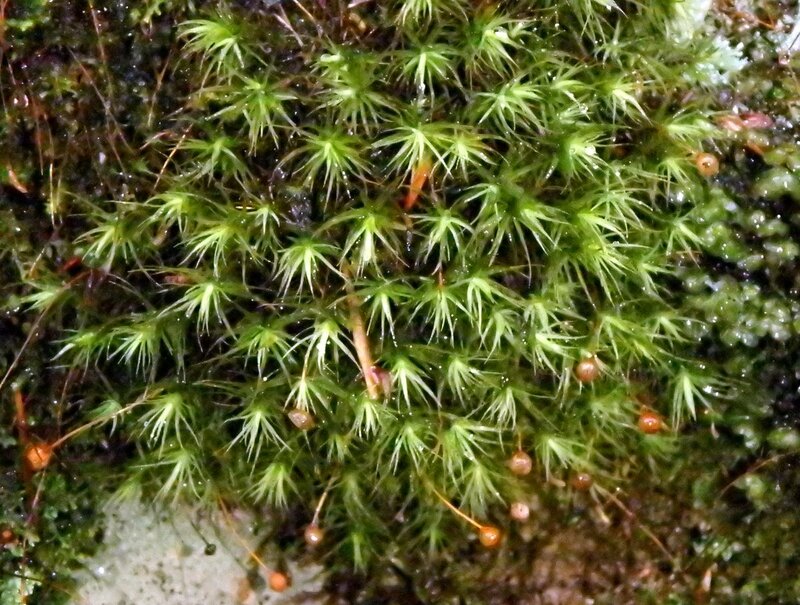 A single clump of mosses can lie dormant and dry for forty years at a stretch, and then vault back again into life with a mere soaking of water. 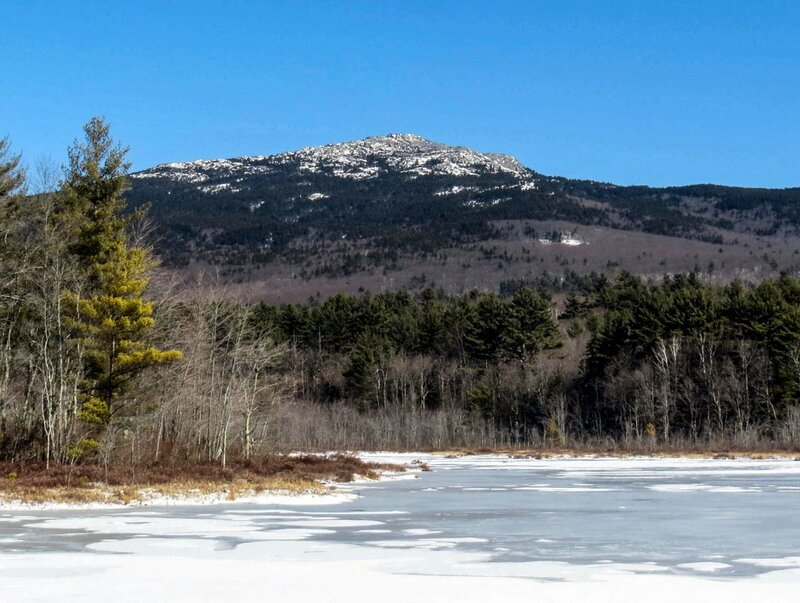 Last Sunday morning I woke from a dream of Mount Monadnock and drove to Perkins Pond in Troy to visit it. It might not be the tallest mountain but it is one of the prettiest, especially in winter when wearing a snowy cap. We had just gotten about 5 inches of snow 2 days before so it was a good time for photos. It’s always hard to know how deep the snow is up there. I climbed to the summit in mid-April once and found snow well over waist deep in places. 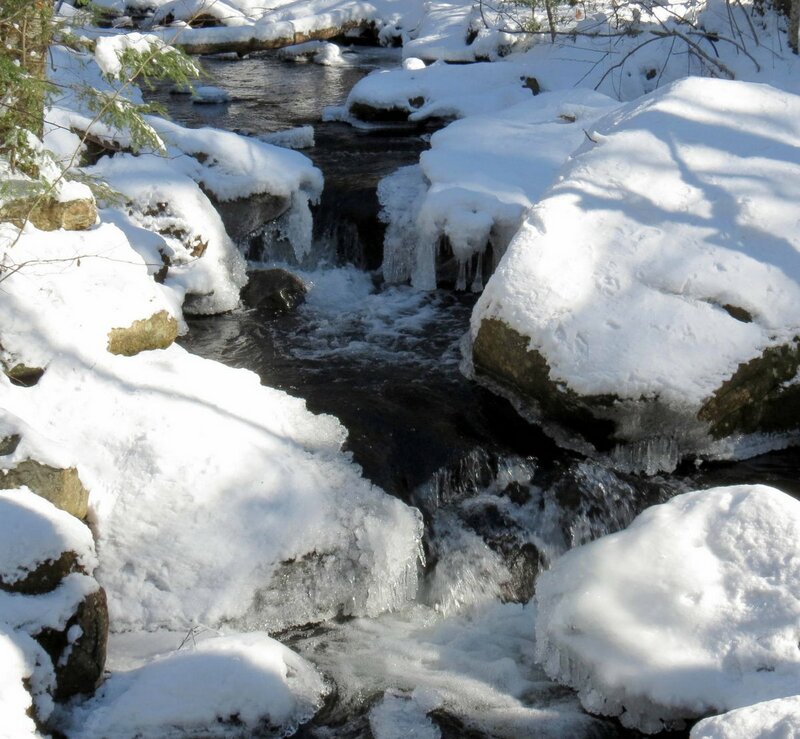 It was very rough going without snowshoes and I shouldn’t have done something so foolish. 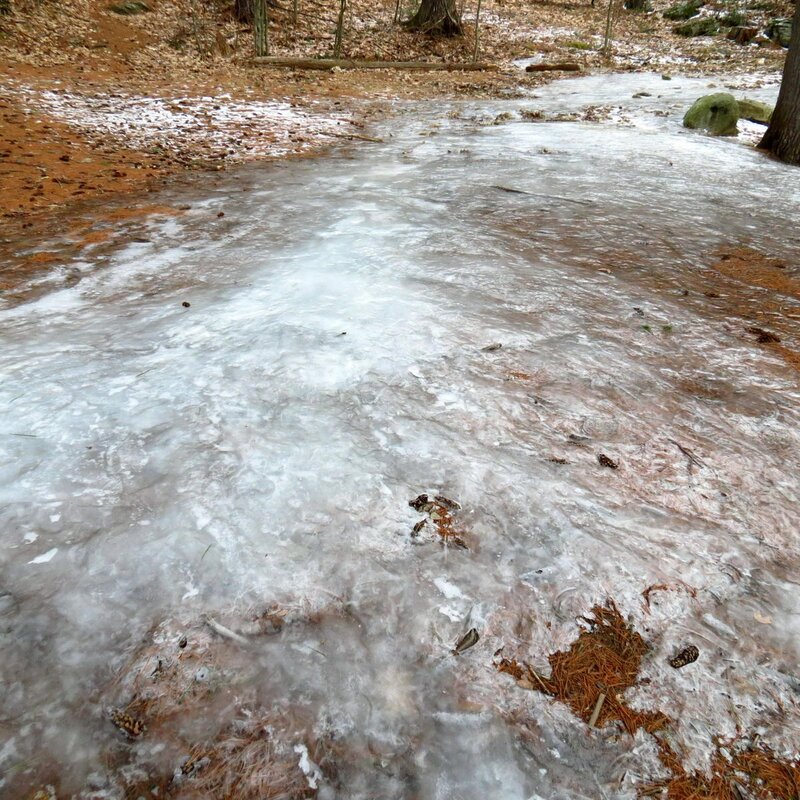 When I finally got back down I was dripping wet and looked like I had fallen into the pond. 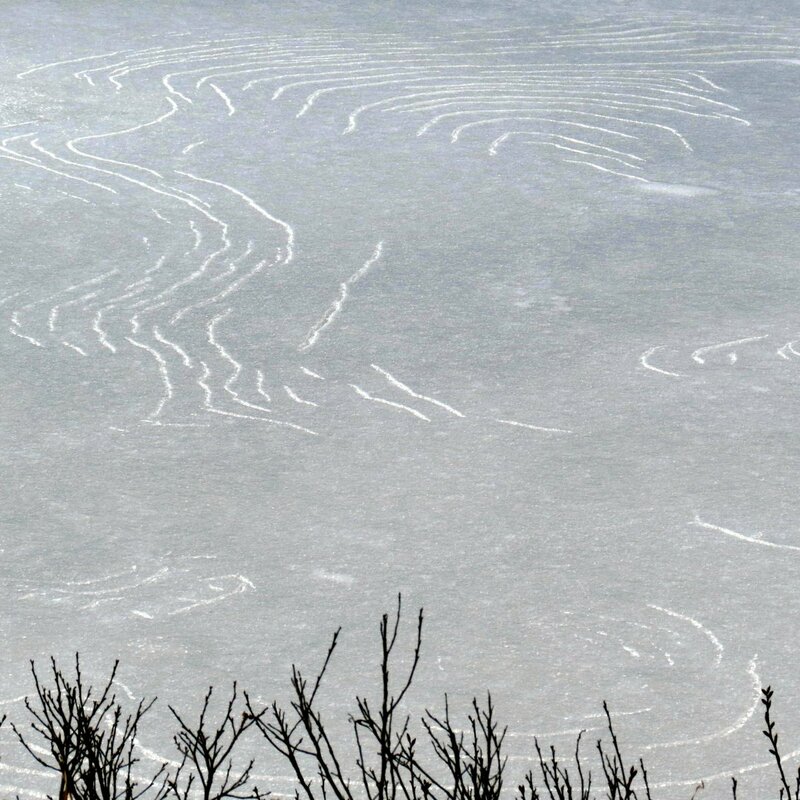 There were ripples in the ice showing what you couldn’t see when it was in its liquid state. From here I decided to make the short drive to Dublin to see something I’d wanted to see since last summer. It would have been a short drive if I had stayed on the highway but I decided to take the back way. I was able to go much more slowly than I could have on the highway and so was able to see more. When I pulled over to take the previous photo of the road I heard chuckling and giggling and found that I’d parked near a stream that I didn’t know was there. 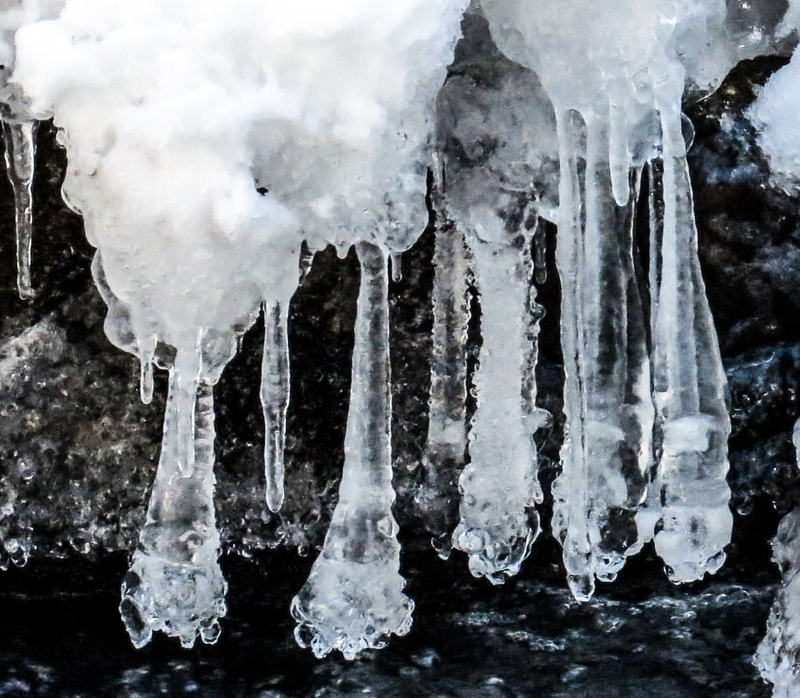 Ice baubles hung from the stones along its banks. 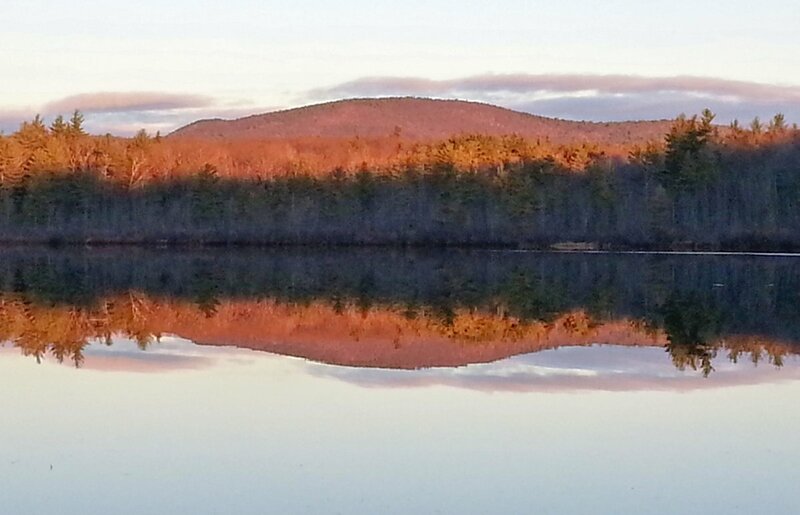 Once I’d reached Dublin Lake I saw what I had come to see. Each morning for the last 6 months I’ve seen this fallen tree on the shoreline out of the corner of my eye as I’ve driven past. Though I’ve only seen it for seconds at a time I’ve seen it burning orange from the light of the rising sun, deep indigo blue in the twilight before dawn, and as a black silhouette in fog so thick I could barely see the road. It has become something I look forward to seeing; a half way point on my journey and an oracle that hints at the weather for the coming day. I told myself that one day I’d see it in full daylight, and now I have. I stopped at the branch river in Marlborough on my way back from Dublin to see if the melting snow had raised the water level. It didn’t seem any higher than normal and though there was a little snow on its banks there wasn’t a bit of ice on it that I could see. 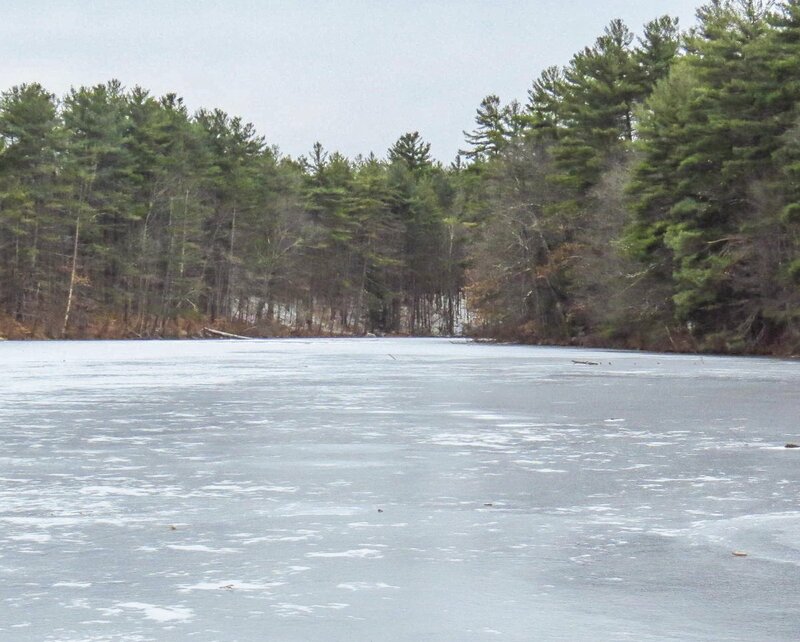 I’d seen a lake and a pond covered with ice and a river with none, so I decided to visit a popular skating pond in a local Keene park. 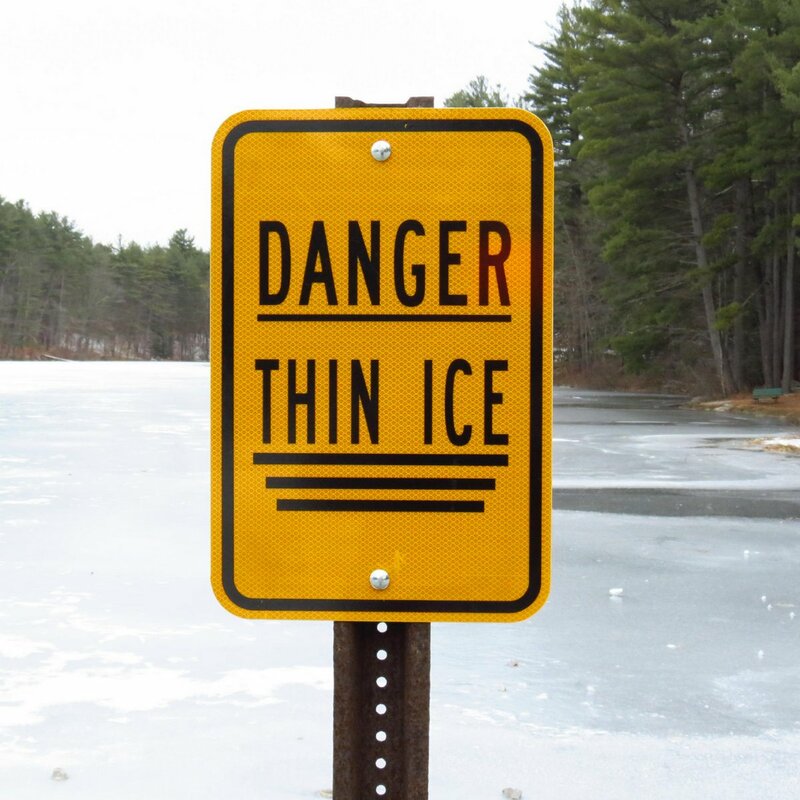 It told the story of our winter so far; yes, the ice grew but never thickened and it isn’t safe to be on anywhere in the state this. 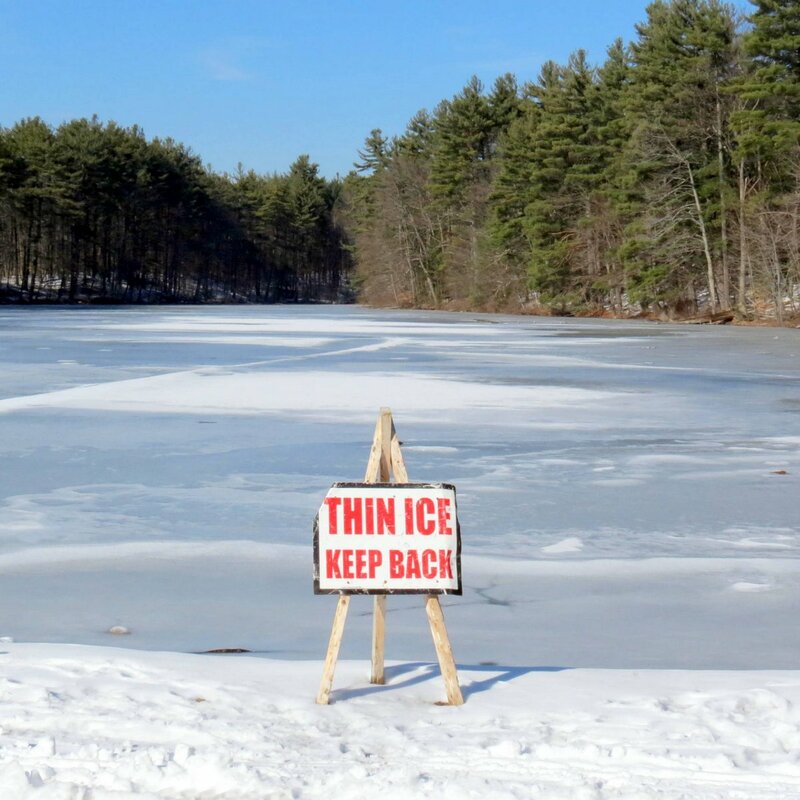 There has been no skating, hockey, ice fishing or much else that needs ice or snow this winter. Though I’m not a great lover of winter I am sorry that the people who enjoy it can’t have their fun. 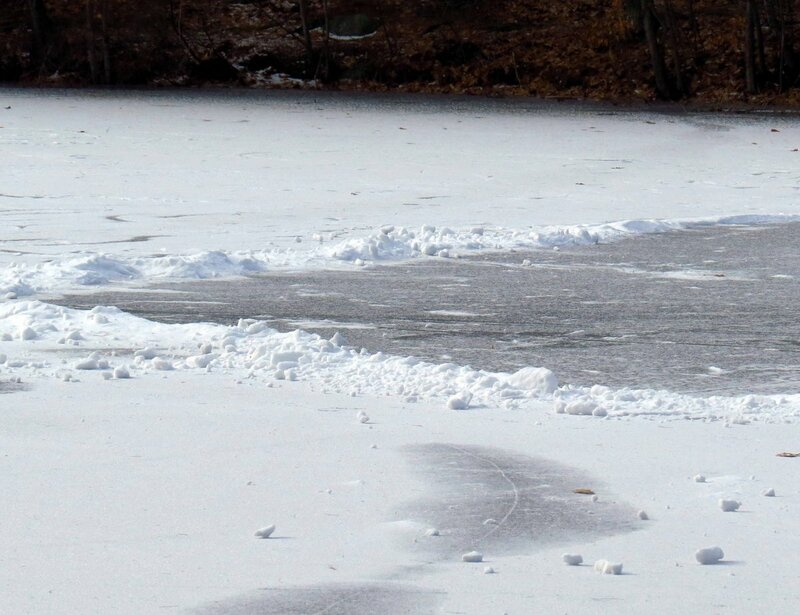 After all, I learned to skate on this very pond when I was a boy and spent many happy hours here. 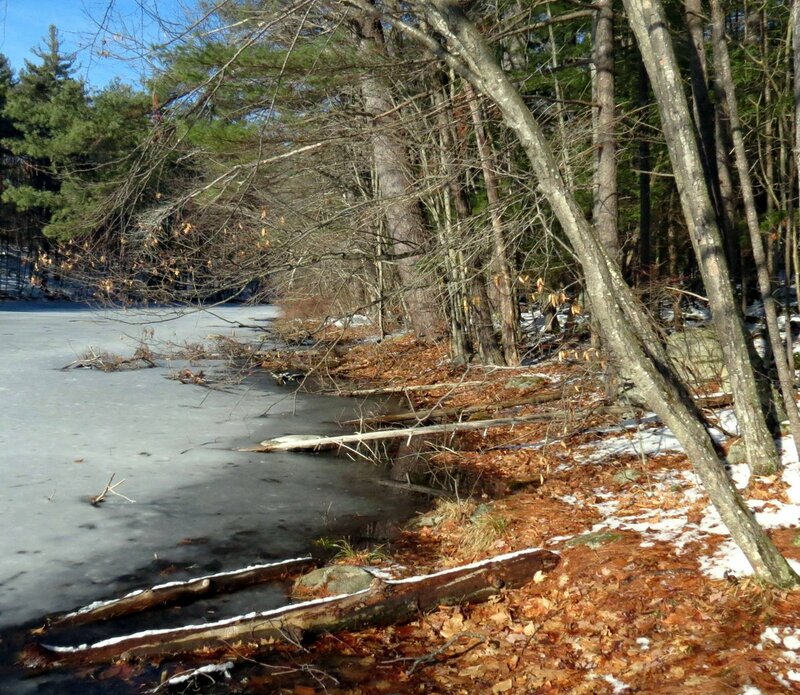 These days I enjoy the pond more for the path around it rather than for the ice on it. Quite a few of the photos that have appeared on this blog over the years were taken here. It’s a great place to find fungi and slime molds and I saw my first maple dust lichen here. I’ve also seen otters playing, cormorants diving, turtles sunning, great blue heron fishing, and frogs hoping I didn’t see them. 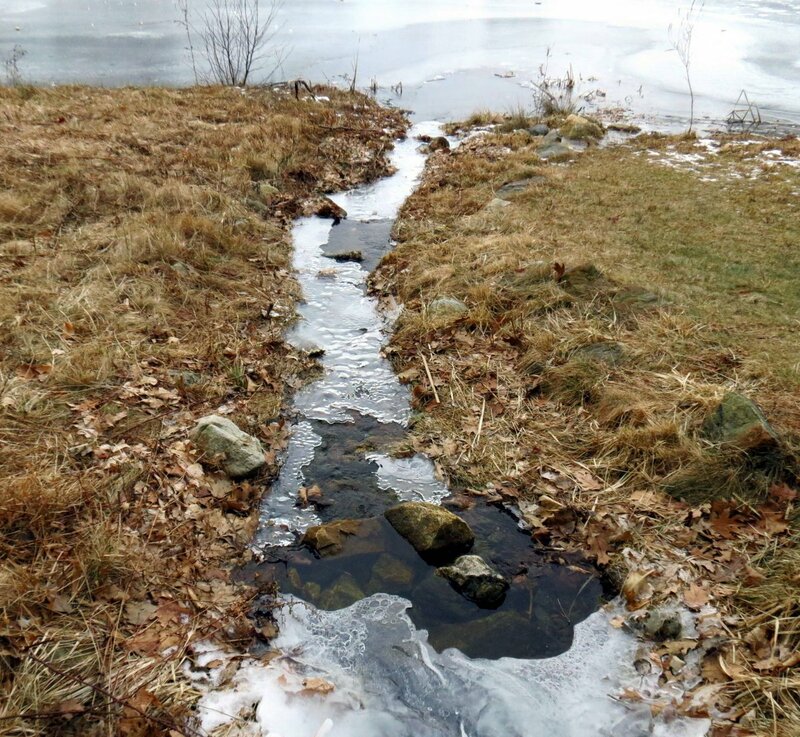 The ice was thin enough to be nonexistent in many places around the shoreline. It was warm; about 48 degrees F, and it felt like a spring day. 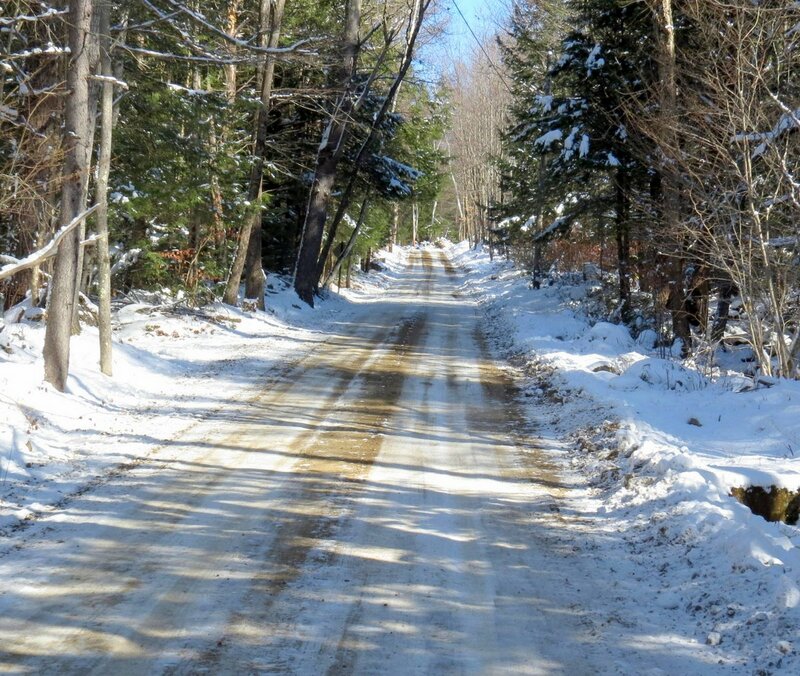 This weekend is supposed to be considerably different, with a high of 14 degrees F (-10 C) expected today. 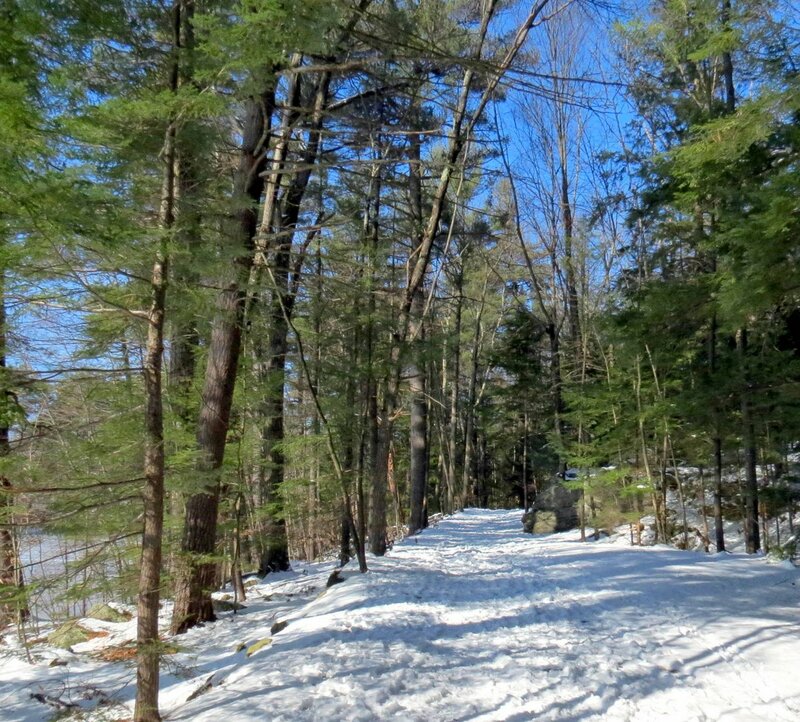 If the sun is shining it might be bearable for a short time, but there won’t be any hikes going on. Tonight they say we’ll see a -20 F (-29 C) wind chill and I hope I don’t have to be out in that. Alders line the shore but they don’t seem to be in any hurry to produce pollen; there was no green dust to be seen on the catkins. They’re wise to wait, I think. Apple moss (Bartramia pomiformis) in the upper left gets its common name from its tiny green, spherical spore capsules which someone thought looked like apples. Broom moss (Dicranum scoparium) in the lower right gets its common name from the way the leaves all point in the same general direction, making it look as if it had been swept by a broom. This photo shows that it would be very difficult to confuse them. Both seemed happy there by the pond. 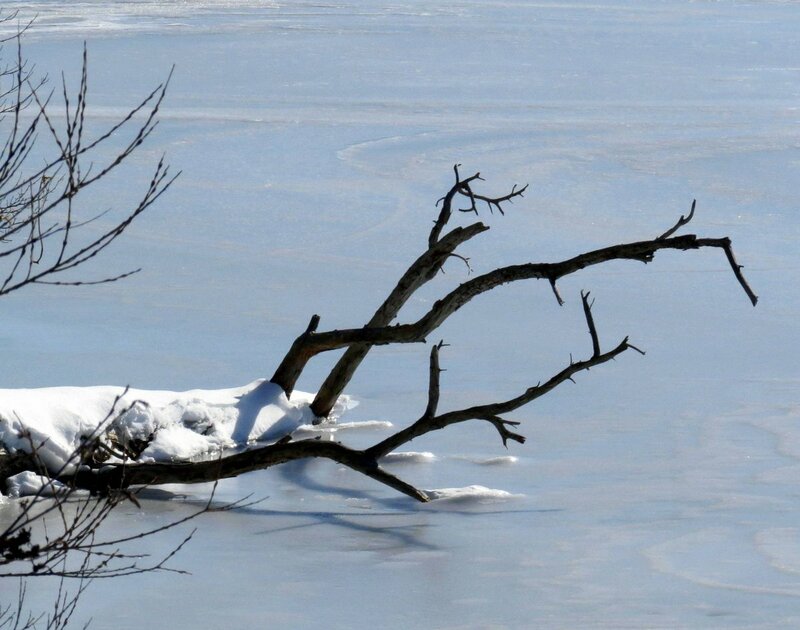 The trees told the story of how the wind blew during the last storm. 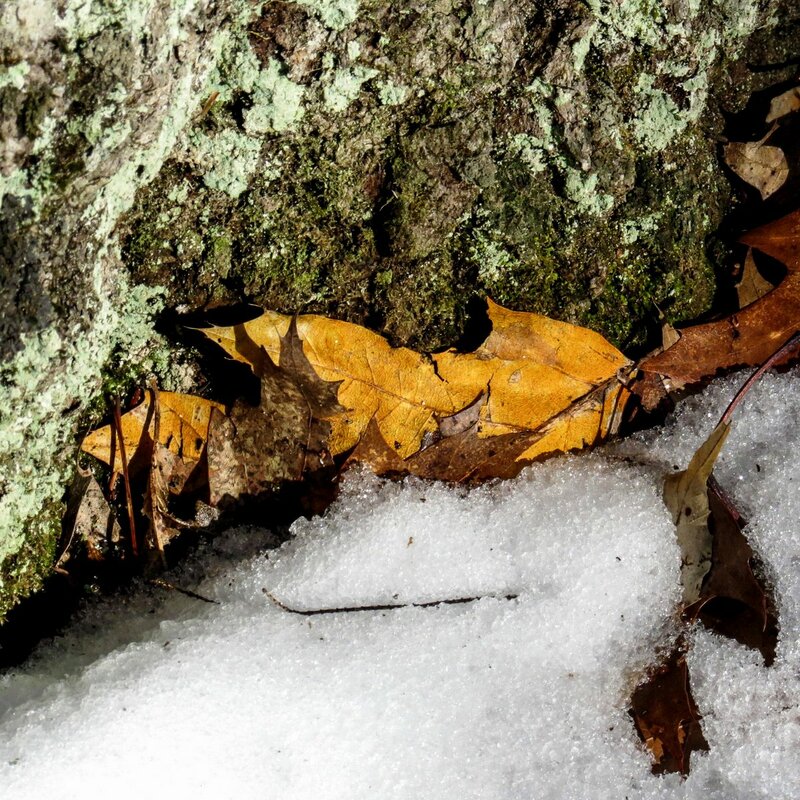 There is more color to be seen in winter than most of us realize, but sometimes you have to look closely to see it. 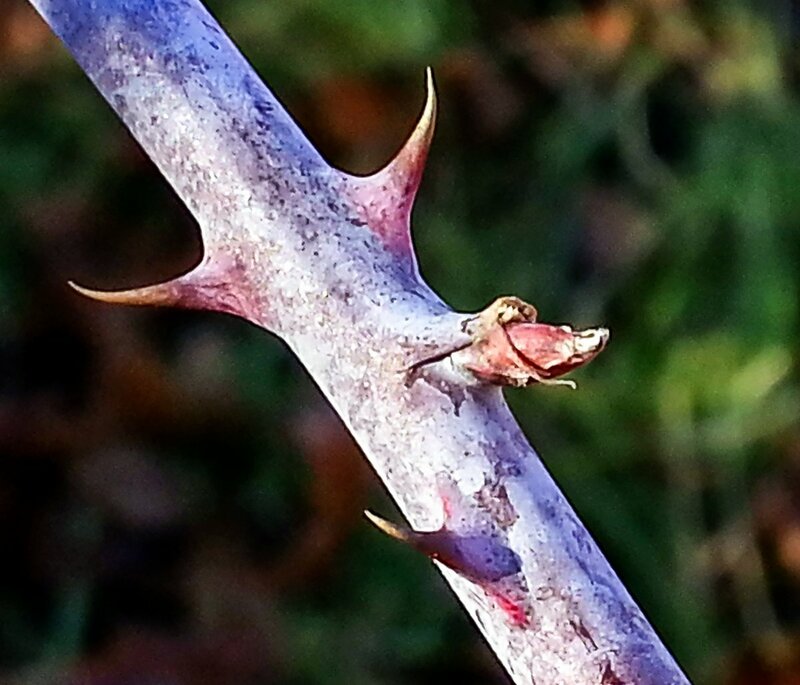 Swamp dewberry (Rubus hispidus) looks like a vine but is actually considered a shrub. 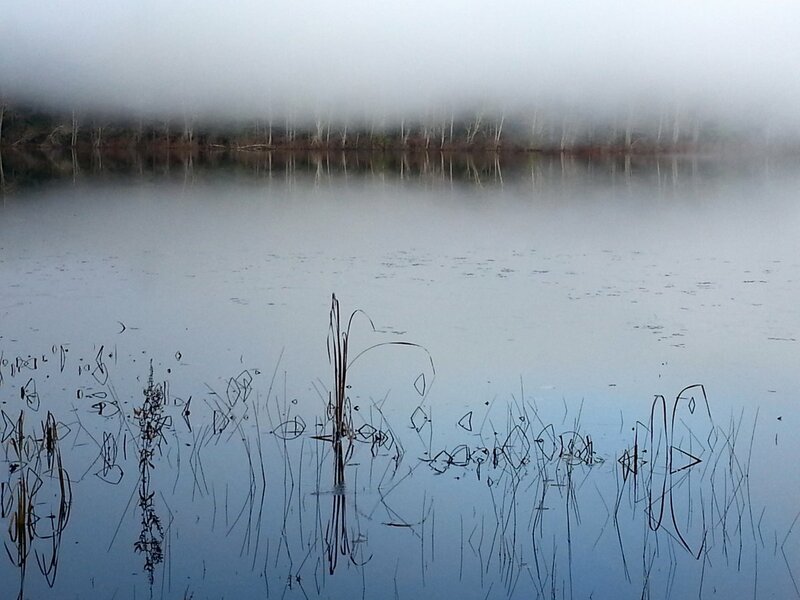 It likes wet places and is a good indicator of wetlands. It’s also called bristly blackberry because its stem is very prickly and its fruits look like small blackberries. I’ve never tried them but they are said to be bitter or tasteless. 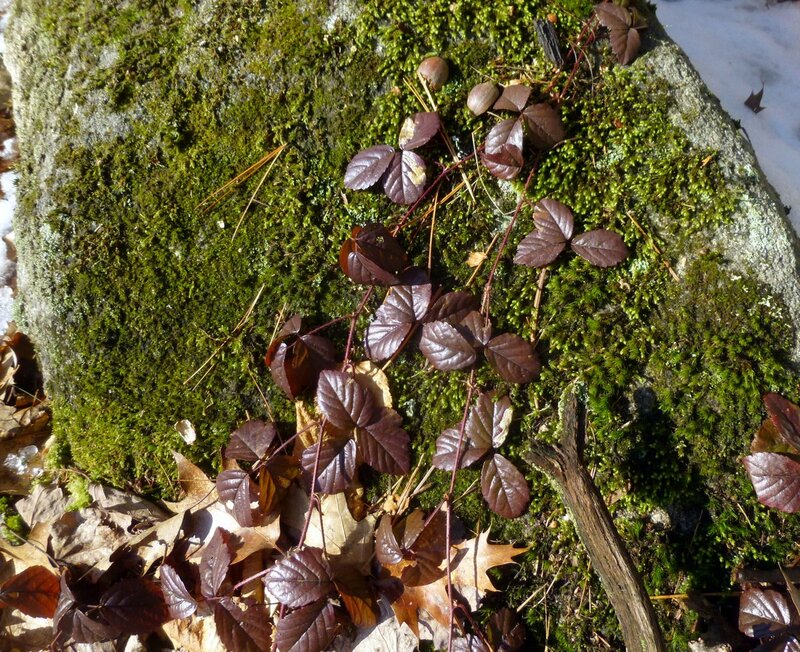 What I love most about it is its purple-bronze leaves in winter. They were so beautiful there against the green of the moss. 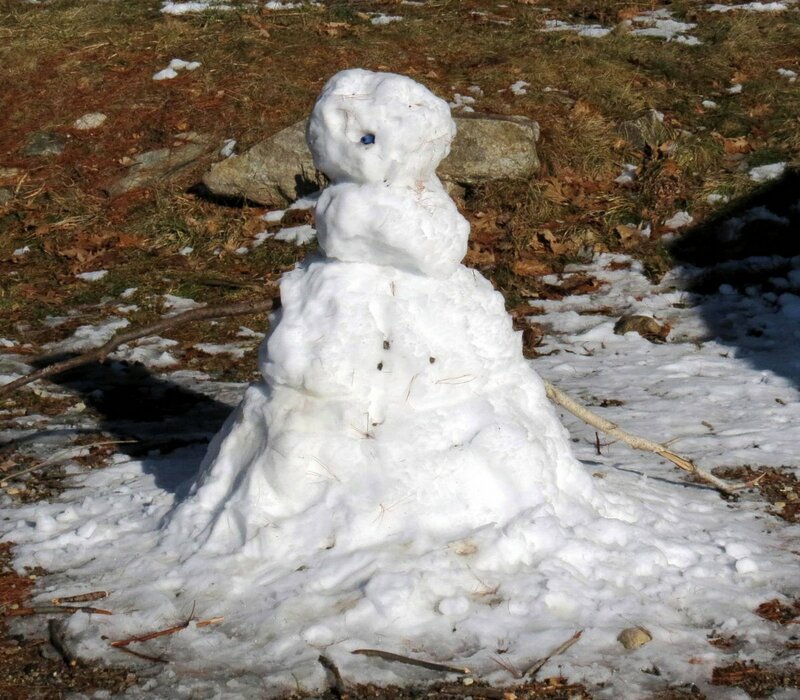 This drooping snowman didn’t seem to be enjoying the spring like temperatures, but he might yet have the last laugh. One of the things that I like about this time of year is how the all the mosses are suddenly so easy to see, so this is when I go visiting them. 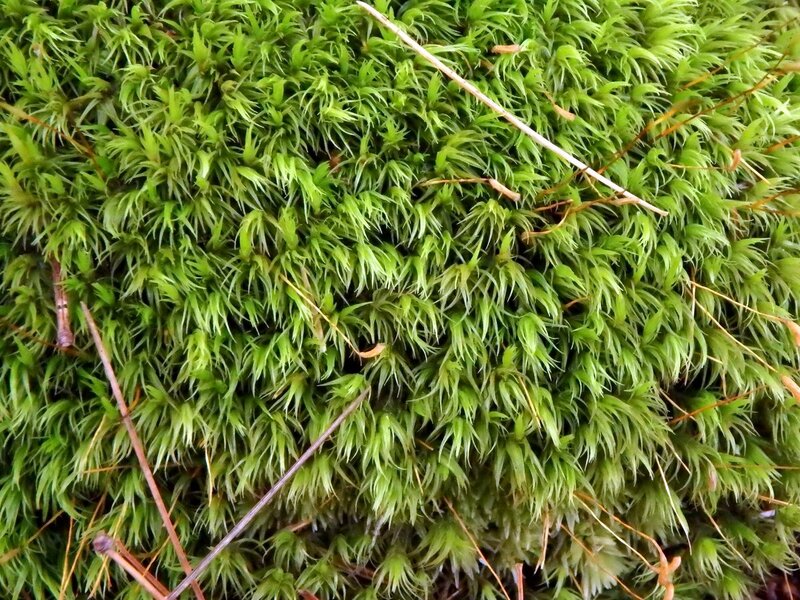 Mosses call to me and make me want to know more about what I’m seeing, so I’ve been studying them for a few years. If a scene like the one in the above photo gets your blood pumping, this post is for you. I’ve been both wanting to do it and dreading it for a while now. If you’ve ever tried to identify mosses I’m sure you understand. 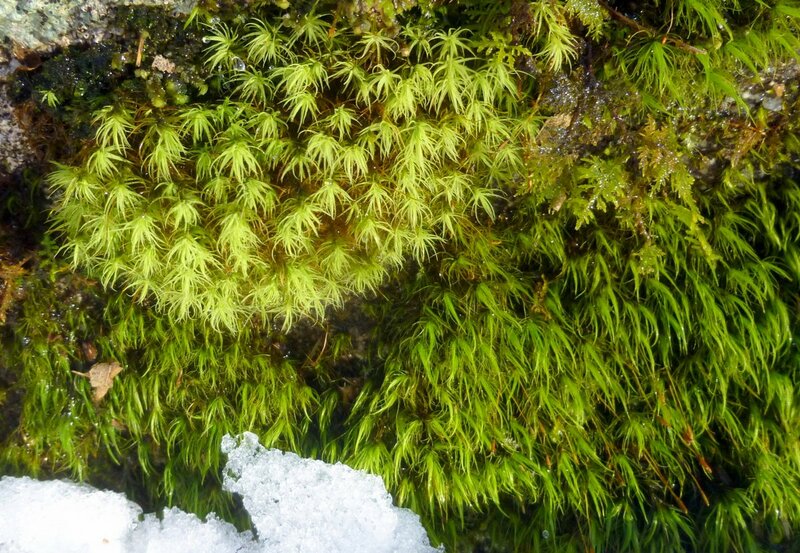 Delicate fern moss (Thuidium delicatulum) changes from deep green to lime green when it gets cold and then eventually becomes one of the more visible mosses. It grows in soil in shaded spots and I find it in my lawn each fall. 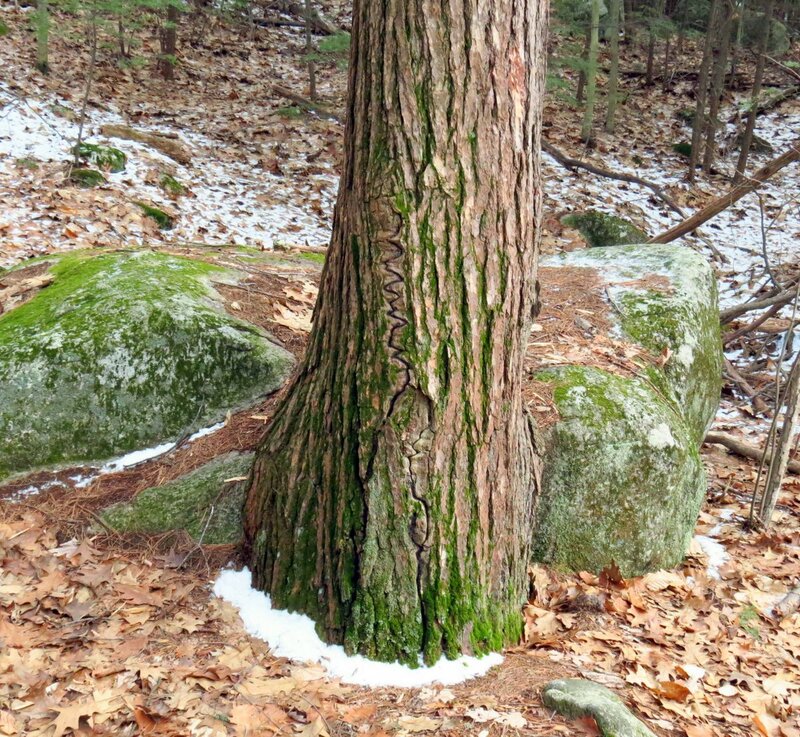 It will also grow on the base of trees and on logs and boulders. It forms quite dense mats as can be seen in the above photo. Orchid growers use this moss in orchid cultivation. 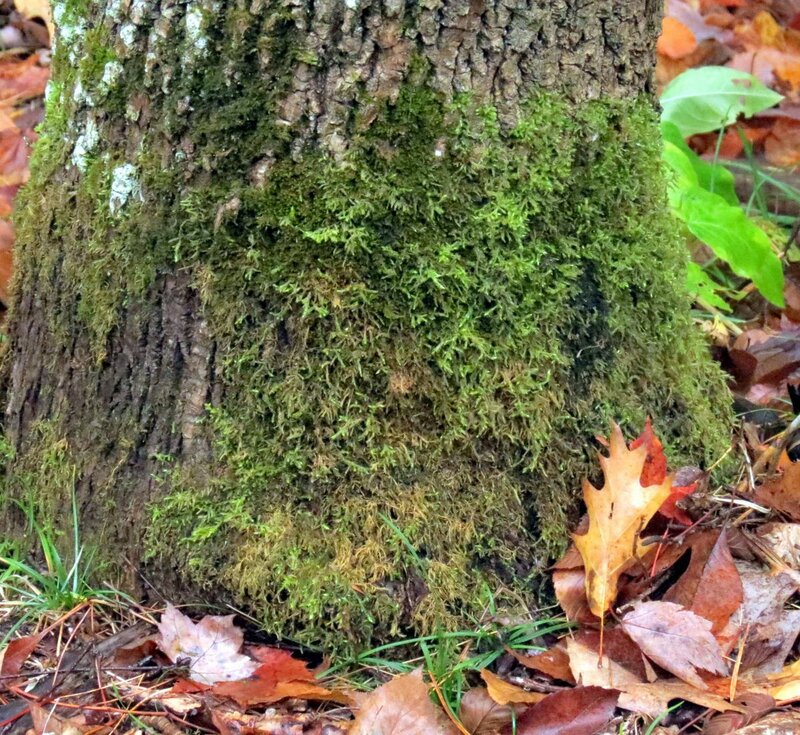 This moss growing on the base of a tree almost had me fooled into thinking that it was tree skirt moss (Anomodon attenuates) but a closer look has me believing that it must be rambling tail moss (Anomodon viticulosus) instead. This moss is too long to be tree skirt moss, I think, and its habit of growing out away from the trunk isn’t right for that moss either. The main stems of rambling tail-moss are said to be creeping with blunt ends like a paintbrush, and they arch upward when dry like a hook. That and their yellow green color are what lead me to choose Anomodon viticulosus, but I could be wrong. Common haircap moss (Polytrichum commune) is one of the most common and also one of the largest mosses in this area, and that makes them easy to identify and study. I find them growing in soil just about everywhere I go. Last year I found a blue haircap moss spore capsule but this year the best I could do was salmon pink. These capsules are rectangular in shape with corners and often sunken sides as the photo shows. The light colored ring on its end is called a peristome and has 64 tiny teeth around its inside diameter, which is measured in micrometers. 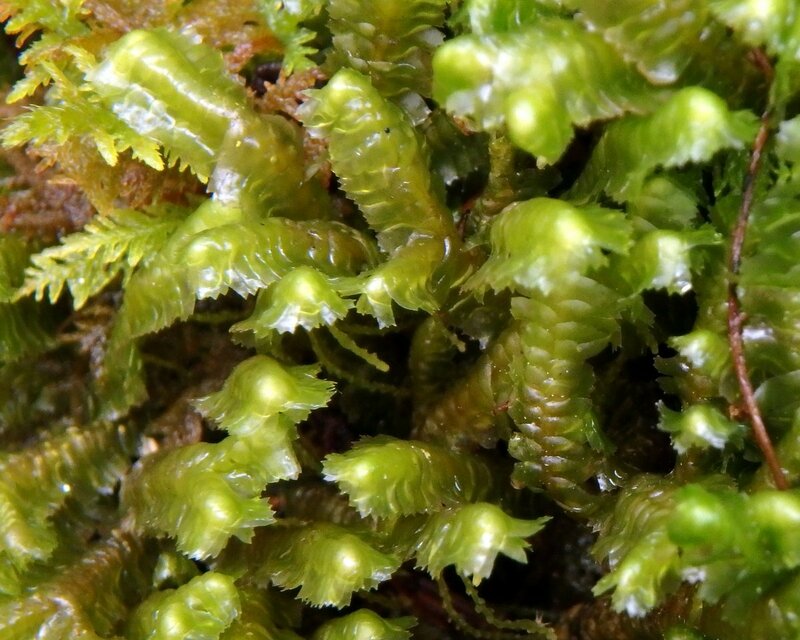 The teeth can’t be seen in this photo and neither can the cap, called a calyptra, which protects the spores and in this instance is hairy, and which is what gives this moss its common name. When the spores are ready to be released the calyptra falls off and the spores are borne on the wind. 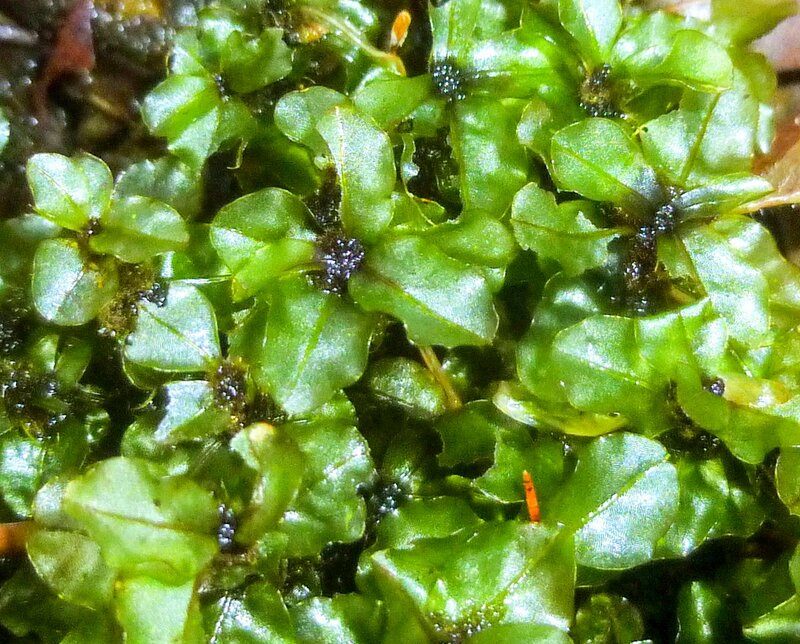 Red penny moss (Rhizomnium punctatum) is a very small but leafy moss that was renamed from Mnium punctatum. I find it growing in deep shade in the soaking wet soil of seeps. 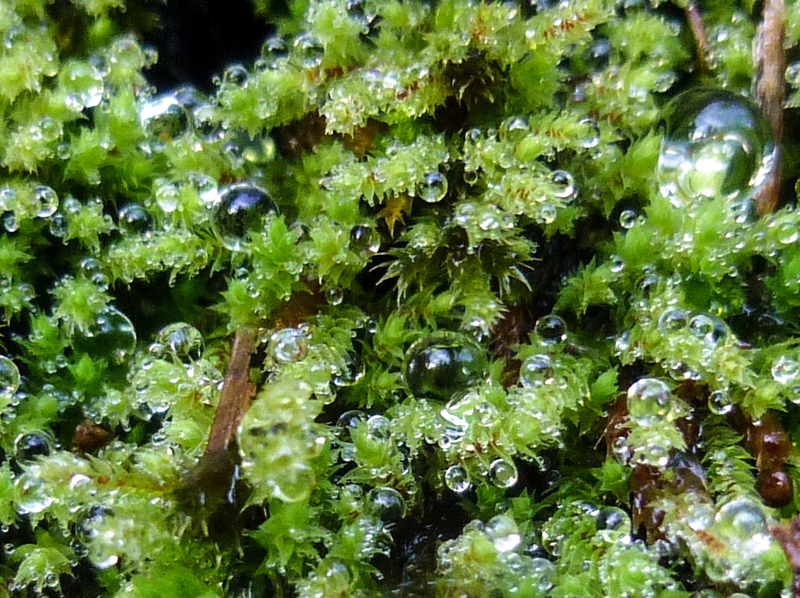 It is a forest moss but only in very wet areas that don’t easily allow kneeling for a photo. On male red penny moss plants in the center of the leaf rosettes are what look like tiny blackberries. These are actually the antheridia, which are where the sperm is produced. When mature the sperm will wait for a rainy day and then will swim to a female plant. Once fertilized the female plant will produce spores and send them off on the wind. 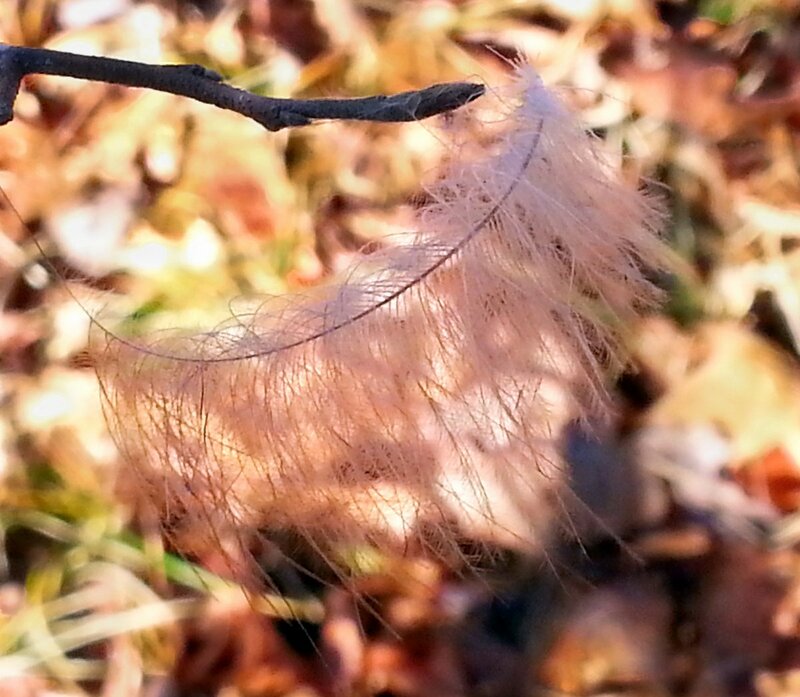 It looks like apple mosses (Bartramia pomiformis) are growing white whiskers for winter. Do they always do this, I wonder? Maybe I’ve just never noticed, but since this is one of the easier to see mosses I don’t know how I could have missed it. 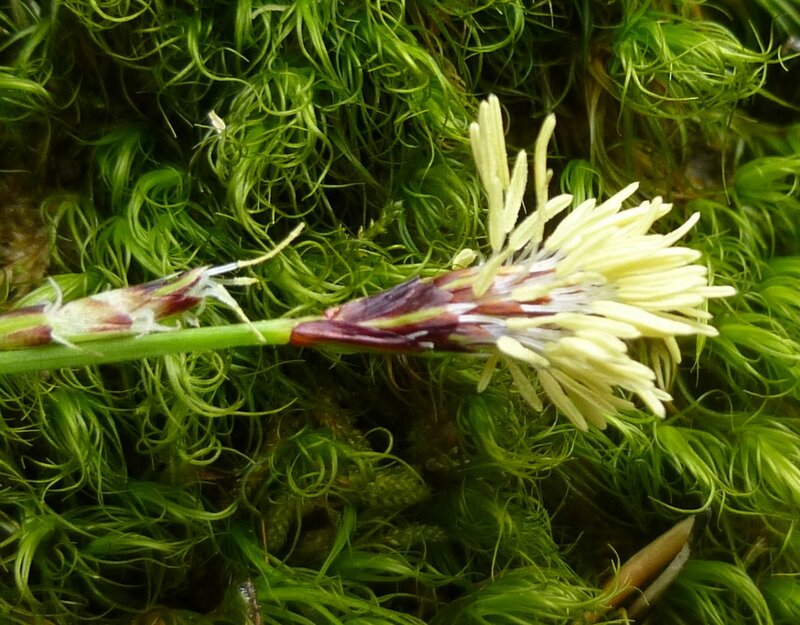 I’ve looked in my moss books and on line and can’t find another example with white tips, but on this day I saw many. 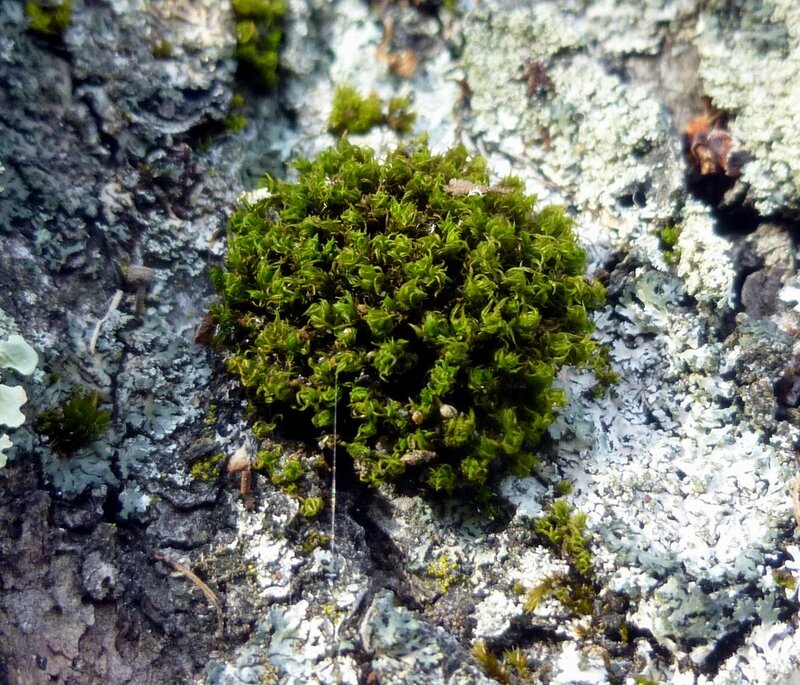 This moss gets its common name from its spherical spore capsules that some say look like tiny green apples. In her book Gathering Moss author Robin Wall Kimmerer tells of an experiment where chipmunks were coaxed into running over some sticky paper. 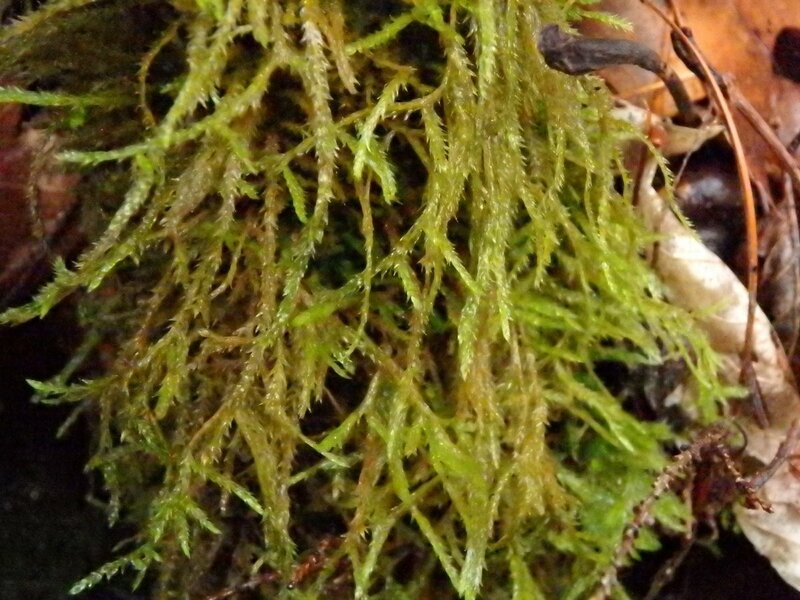 When the paper was examined it was found to have thousands of moss spores stuck to it, so if you’ve ever wondered how mosses get 100 feet up in the tree tops thank a chipmunk, because the spores stick to their feet. And squirrel’s feet too, I’m guessing. Of course, wind and rain also carry spores so rodents don’t have to do all the work. 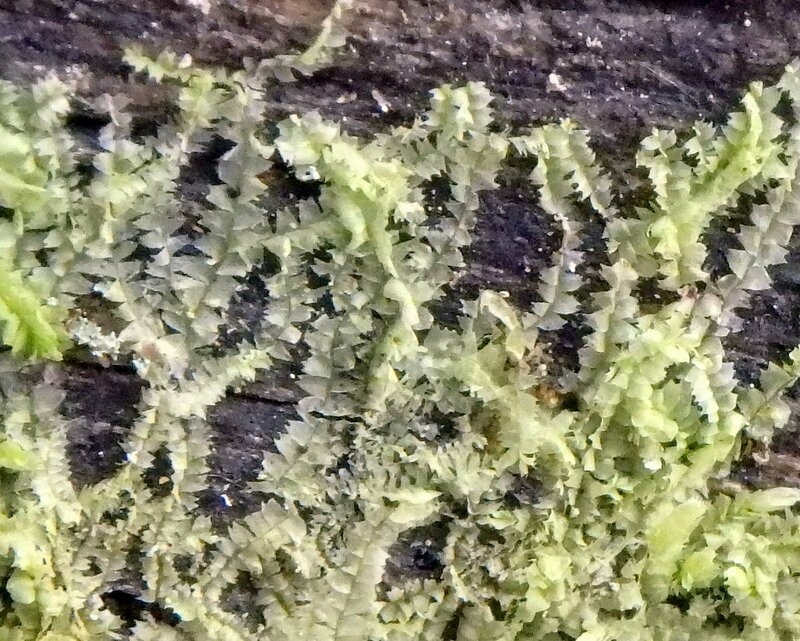 The above photo is of tiny green moss islands I found on the trunk of a tree, and I think it shows the spores just becoming recognizable plants. I wish I’d seen that lichen on the right with rose colored apothecia when I took this photo. It’s a beauty. I think the moss islands in the previous photo will turn into something like this clump of crispy tuft moss (Ulota crispa.) 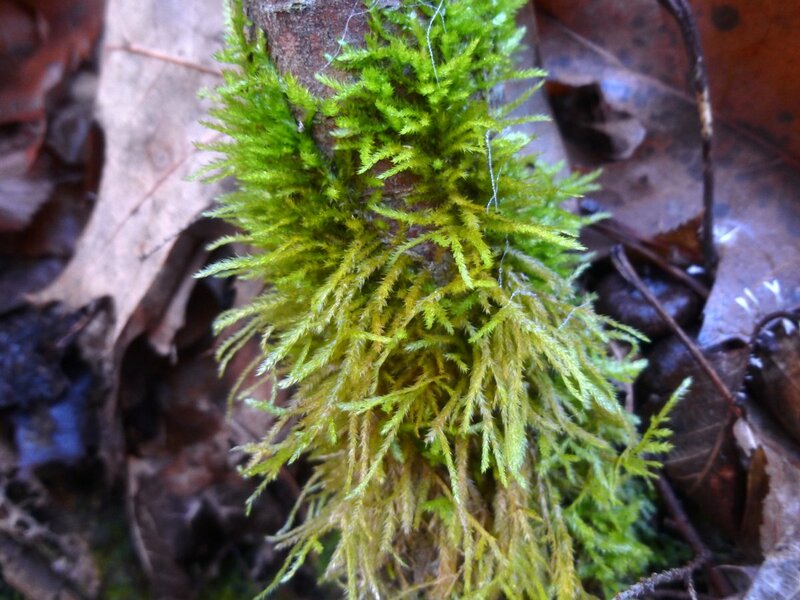 This moss is very common on tree trunks in these parts and I see it all the time. 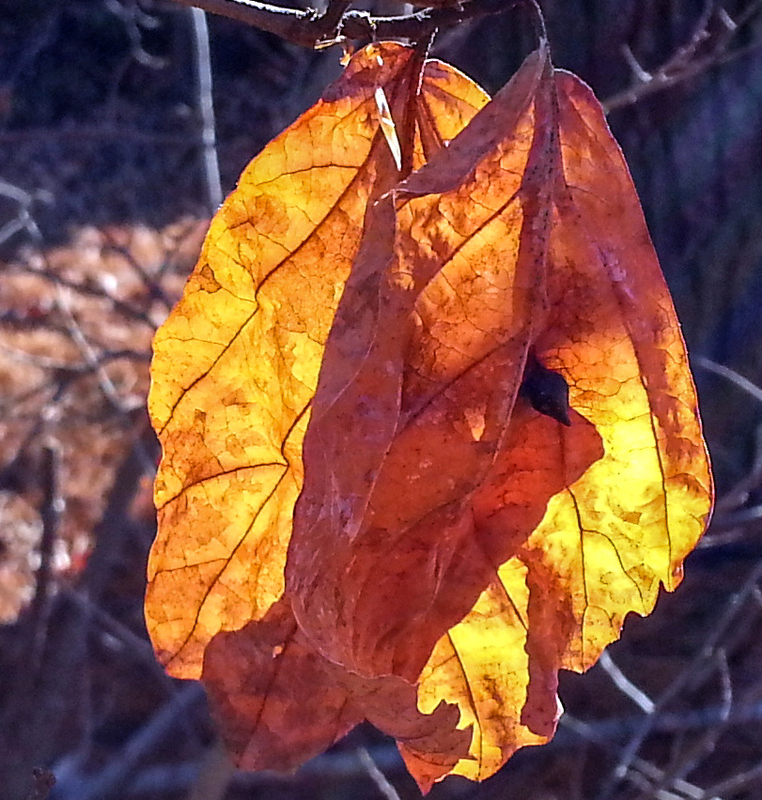 When dry its leaves tighten and curl. This clump was about an inch across. 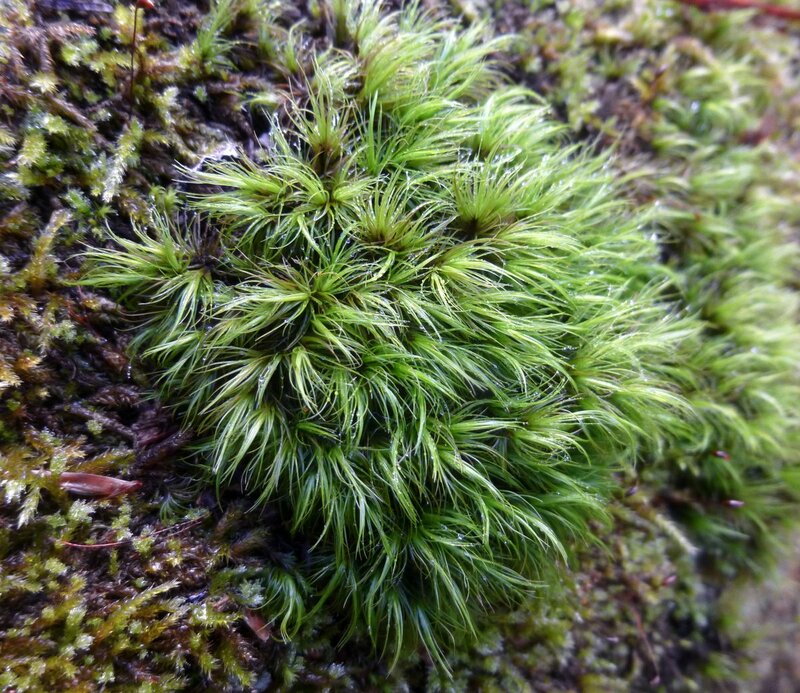 Some mosses are so animal like they make you want to reach out and pet them. This broom moss (Dicranum scoparium) is one of those that I had to touch before I left it. 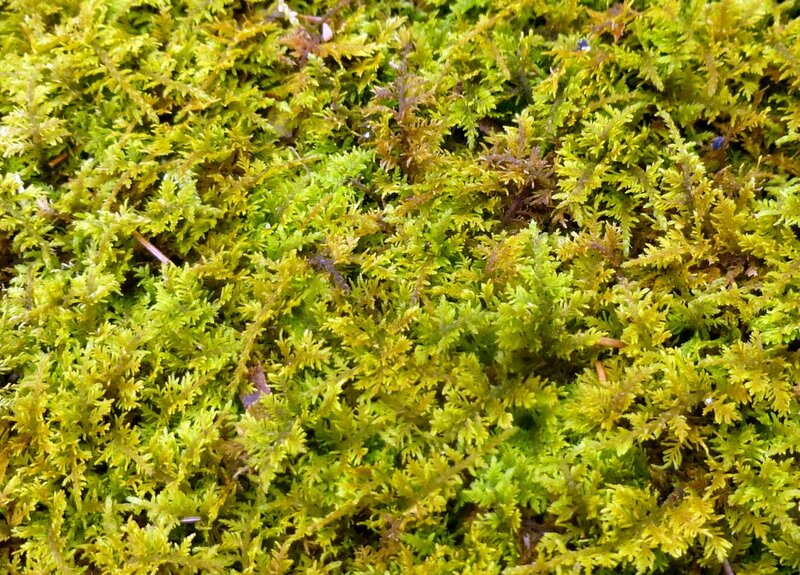 This moss grows on stone, wood or soil in sunnier places and it’s common here. Another very beautiful moss is rose moss (Rhodobryum roseum,) shown here growing against the dark shine of a dog lichen (Peltigera membranacea) on a boulder. Each little rosette of leaves looks like a tiny flower, and that’s how it comes by its common name. Rose moss is a good indicator of limestone in the soil so it’s wise to look for other lime loving plants when it is found. Many native orchids for instance, fall into that category. 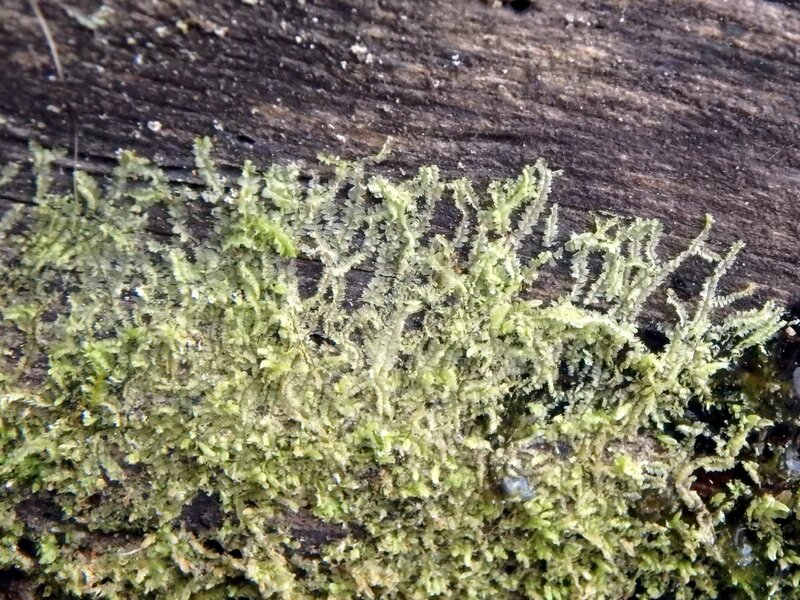 This is the first time this moss has appeared on this blog because I’ve only just found it. I think it might be a moss called river foxtail moss (Brachythecium rivulare) which is said to have a whitish cast. 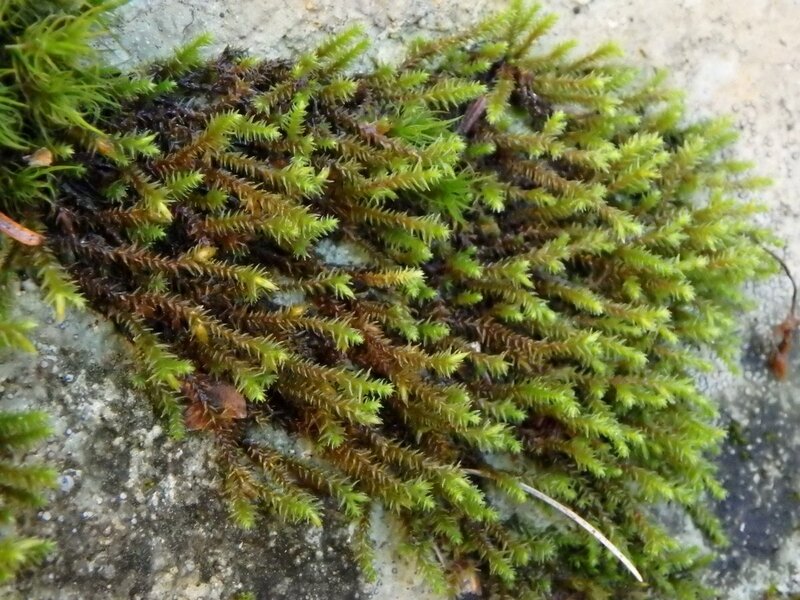 I found it growing in shade on a stone shelf where it was watered by constantly dripping ground water; exactly the habitat that river foxtail moss likes. 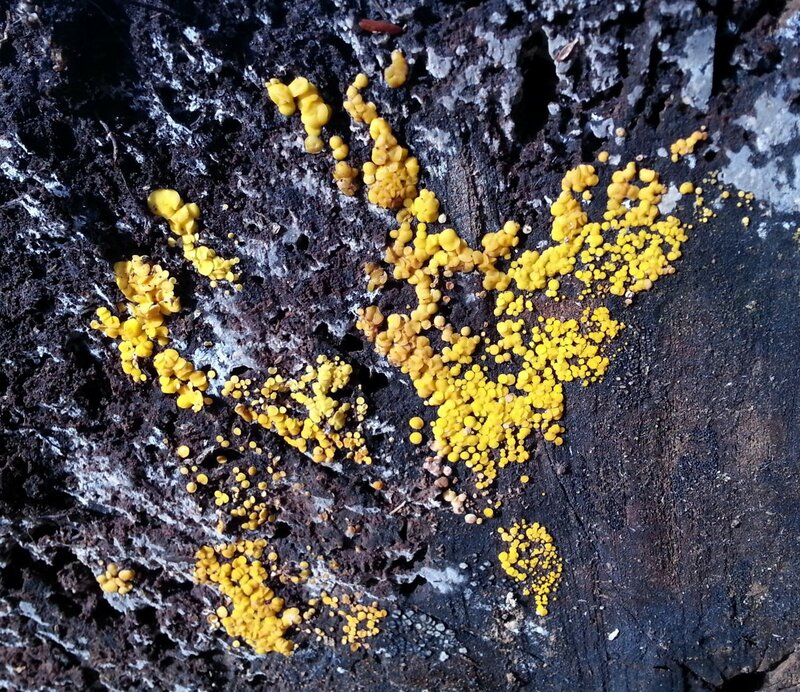 A couple of posts ago I showed what I suspected was a lichen that I found growing on a pine log. Though it felt fleshy like a fungus I had the idea in my mind that it “should be” a lichen, and so when I got home I looked through hundreds (literally) of lichen photos with no luck identifying it. 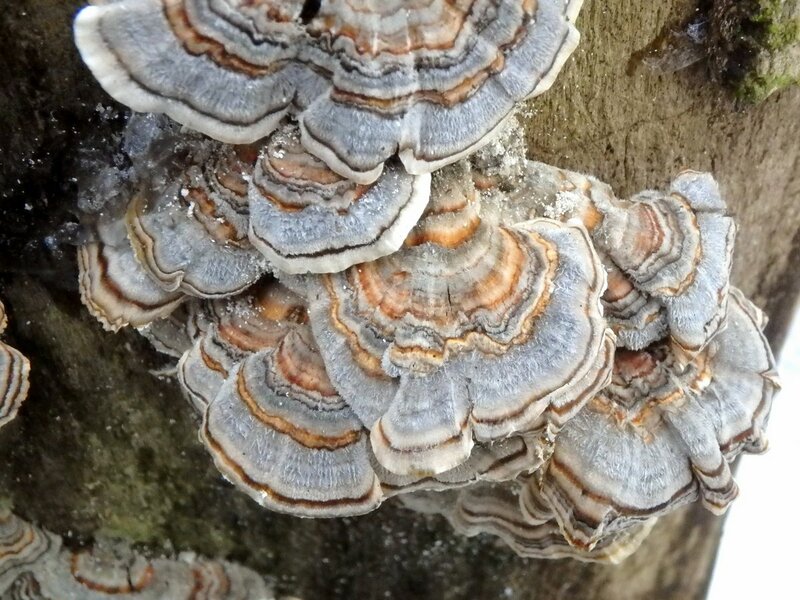 Luckily Rick from the Between Blinks Blog had seen examples before and knew it to be a crust fungus called Phlebia radiata, or wrinkled crust fungus. These curious fungi lay flat on whatever they grow on much like crustose lichens would, and radiate out from a central point. They have no stem or gills or pores. Most interesting about them to me are the various bright shades of pink and orange they display. 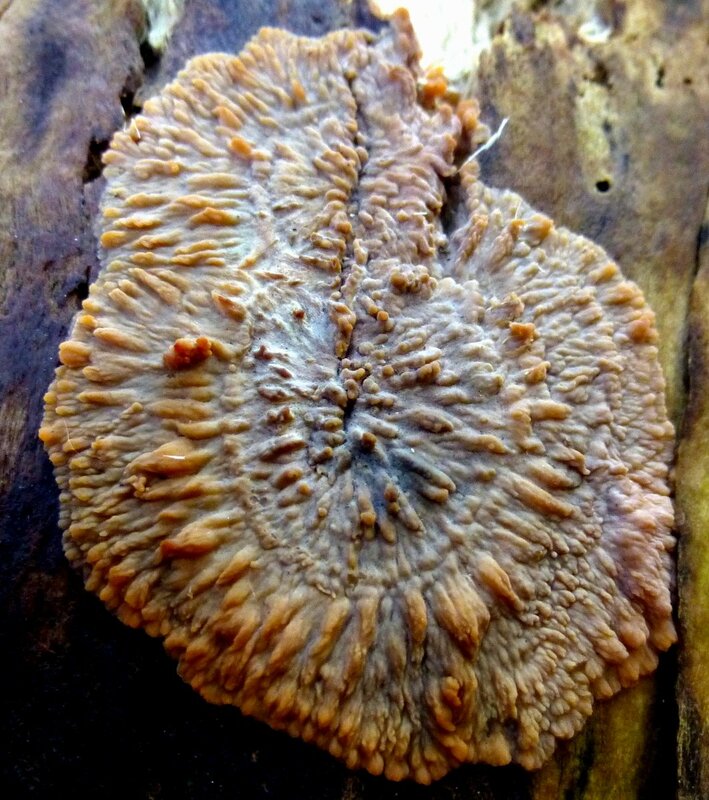 This is a fungus that doesn’t mind cool weather, so it is often seen at this time of year. Thanks again for the ID Rick! 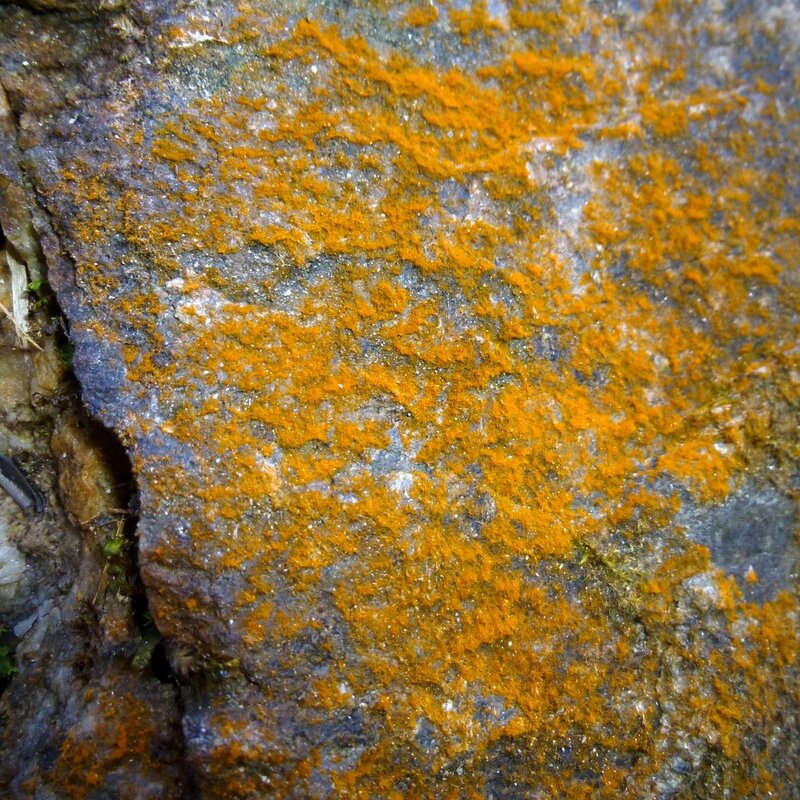 So let’s see, this one I showed in a post from about a month ago is orange like a fungus, grows on stone like a lichen, and is hairy like a moss. I guessed that it might be some kind of strange orange moss, but I’d never seen anything like it. 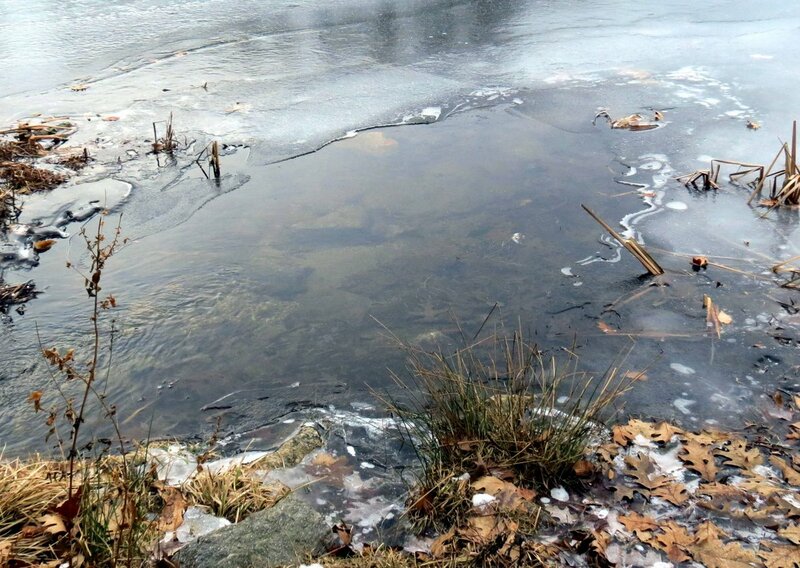 If I hadn’t stumbled across it online while searching for something else I never would have guessed that it was actually a green algae called Trentepohlia aurea. I know, I said the same thing-“it isn’t green, it’s orange.” These algae get their bright orange color from a pigment known as hematochrome, which forms in nitrogen starved algae and protects and hides the algae’s green chlorophyll. 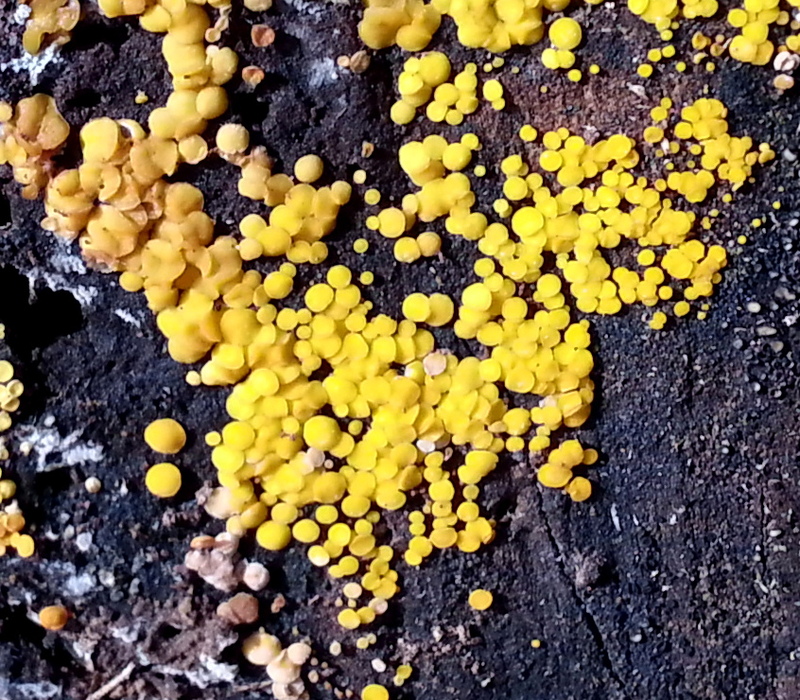 It can be orange, yellow or red and it also colors some lichens, making their identification even more difficult. 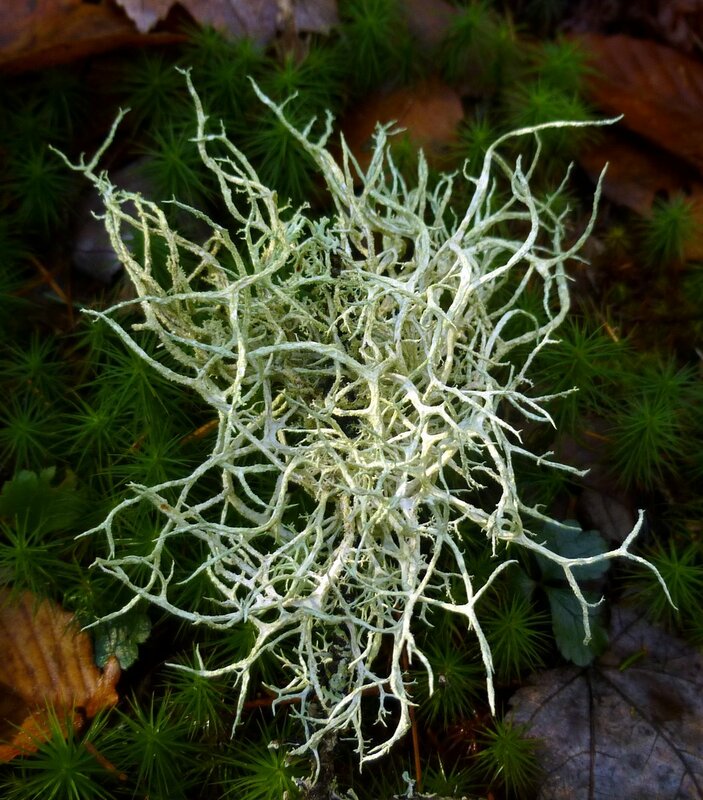 Bristly beard lichen (Usnea hirta) is often found on the ground but it doesn’t grow there; the wind blows them out of the trees. Many lichens like sunlight and grow in the tops of trees where there is less shade from the leaves. 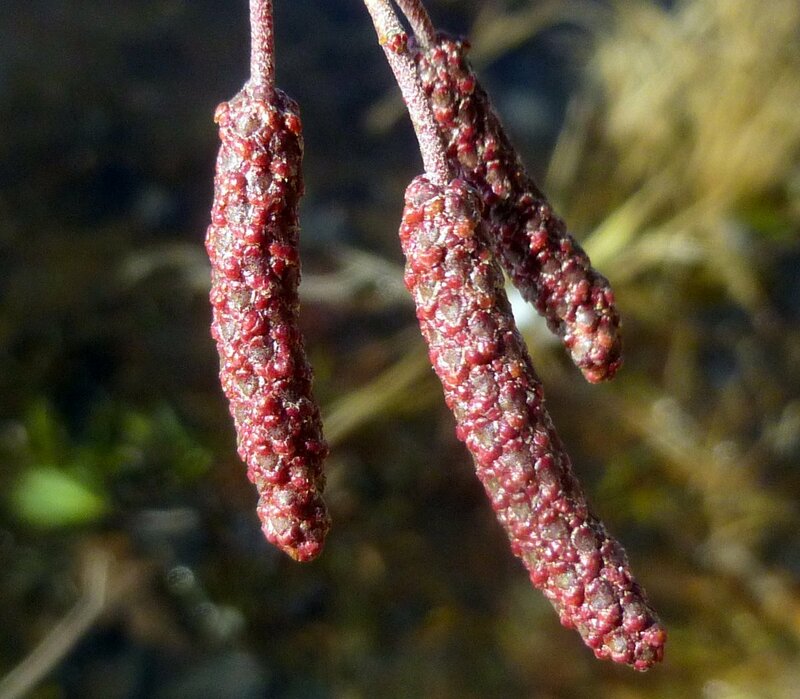 Native Americans used lichens medicinally for thousands of years and lichens in the Usnea group were described in the first Chinese herbal, written about 500 AD. 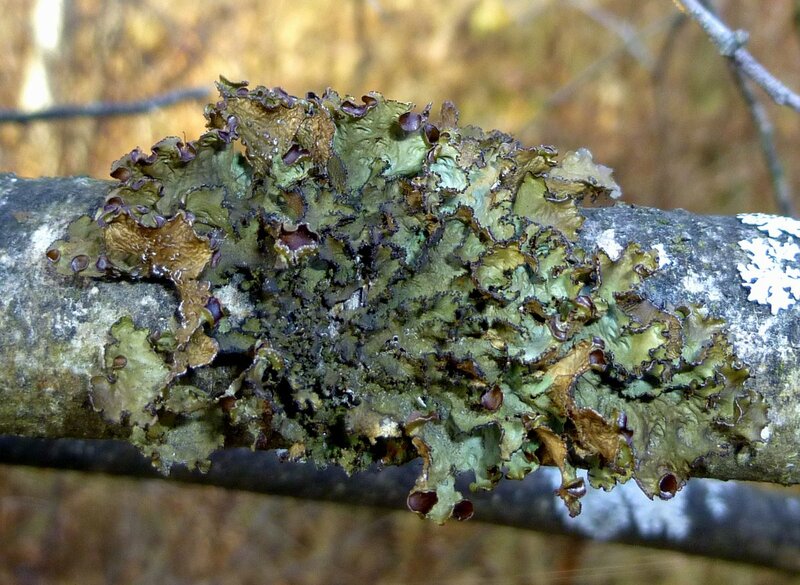 Today scientists estimate that about 50% of all lichen species have antibiotic properties. Last year I found fringed wrinkle lichens (Tuckermannopsis Americana) growing in a birch tree near a pond and they are still there this year. 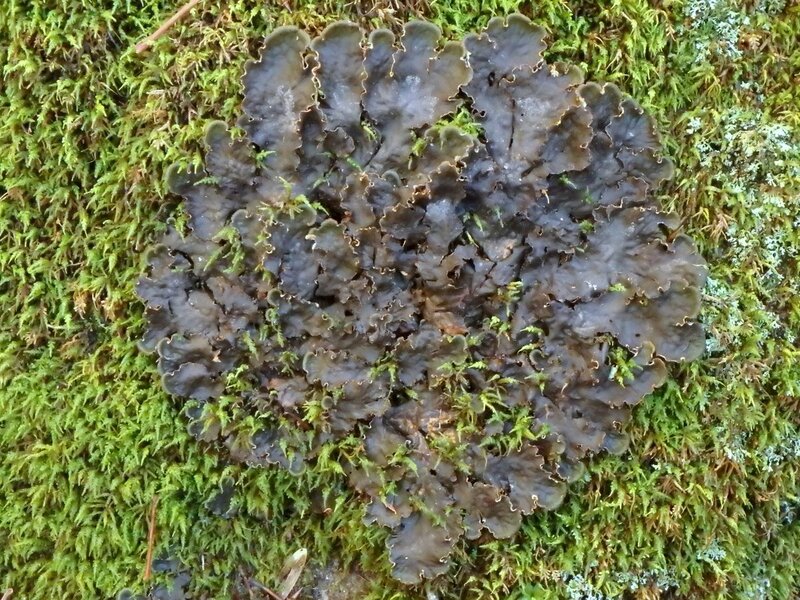 The color of this lichen varies greatly from when it is wet or dry, but its wrinkled surface and the way that its fruiting bodies (Apothecia) appear on the lobe margins help identify it. The purple dye used to color the togas of the rich and famous in ancient Rome came from lichens, and many other dye colors can also be extracted from them. Some of the rich colors used in Scottish “Harris Tweed” also come from lichens. 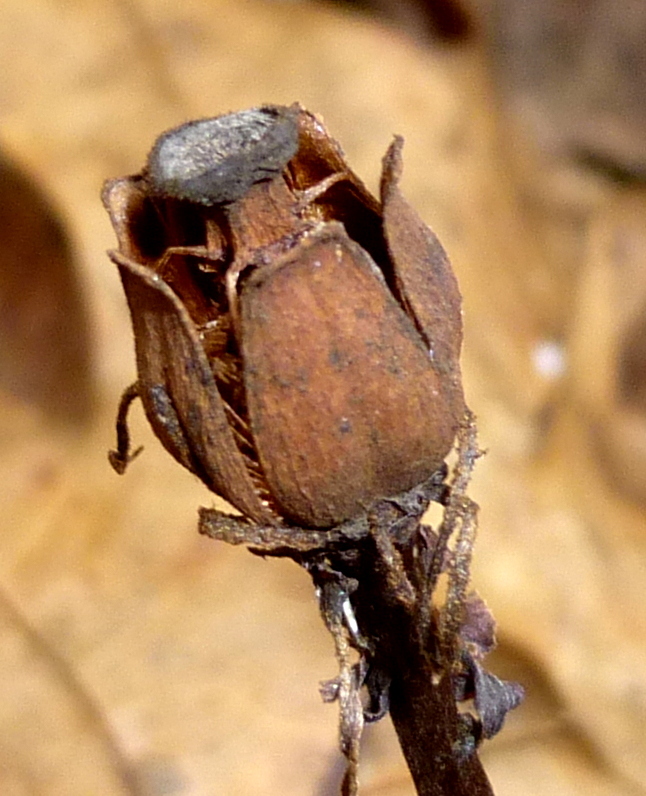 The seed capsule of this Indian pipe (Monotropa uniflora) split open to release its seeds. The seeds are so small as to be nearly microscopic, and are wind borne. Each plant will release thousands of seeds, but if they don’t fall in exactly the right conditions, they won’t grow. Indian pipes need both the right fungi and the right tree roots to grow because they don’t photosynthesize and make their own food. 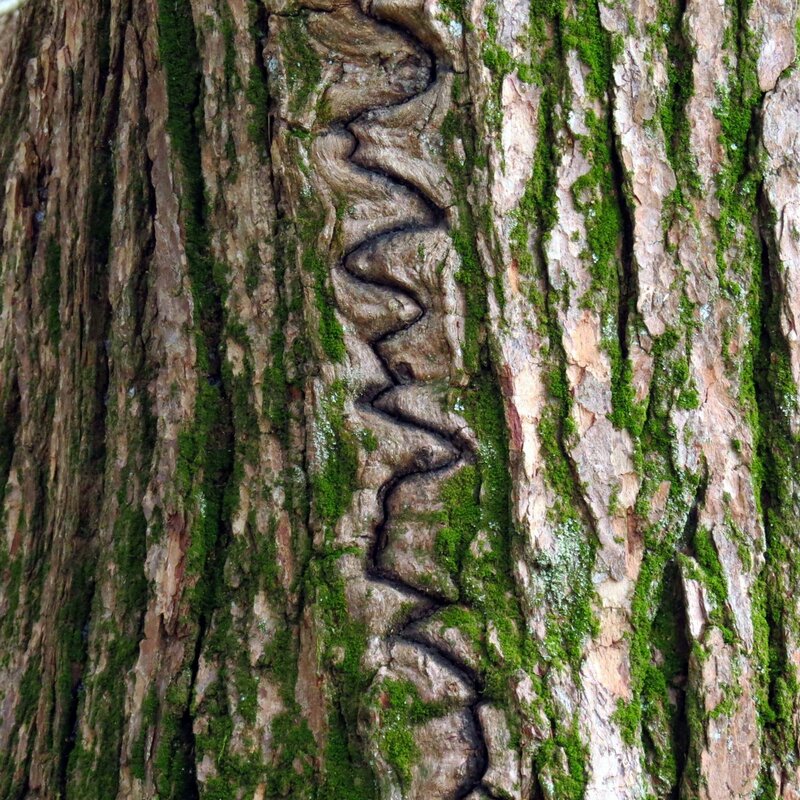 Instead they parasitize both the fungi and the trees they grow on. Cattail (Typha latifolia) seeds are also borne on the wind, but there will be plenty left when the female red wing blackbirds come back in the spring. They and many other birds use the seeds to line their nests. 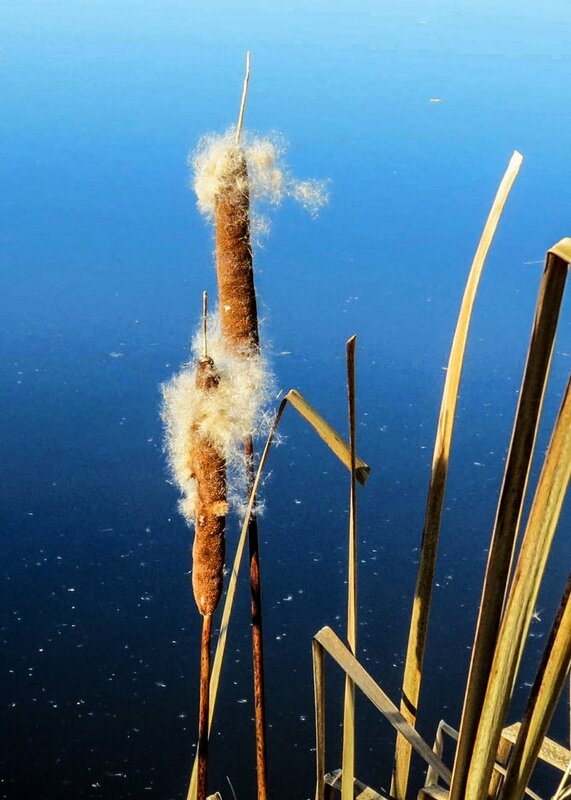 Native Americans had uses for every part of this plant and one of their names for cattail meant “fruit for papoose’s bed.” Even the pollen was harvested and used in bread. This tiny mushroom was all dried out but its dime sized cap had plenty of pores on its underside that were worth taking a look at. 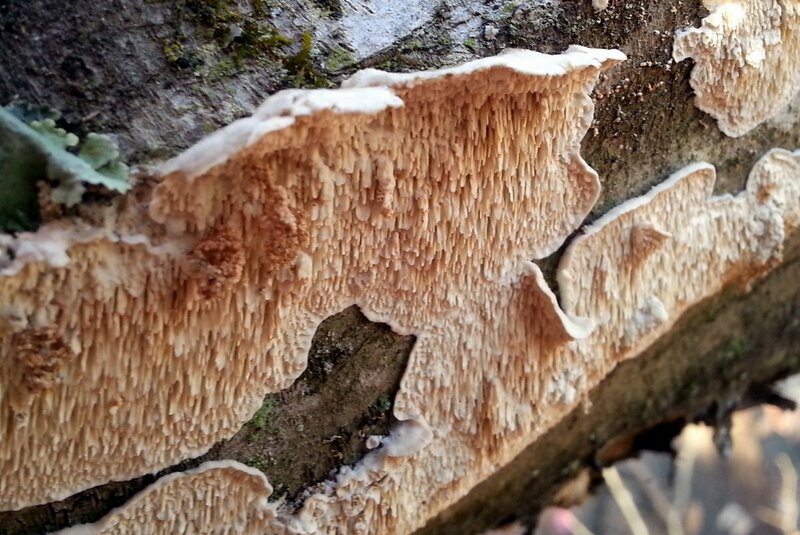 These pores are tubes where the mushroom’s spores are produced. 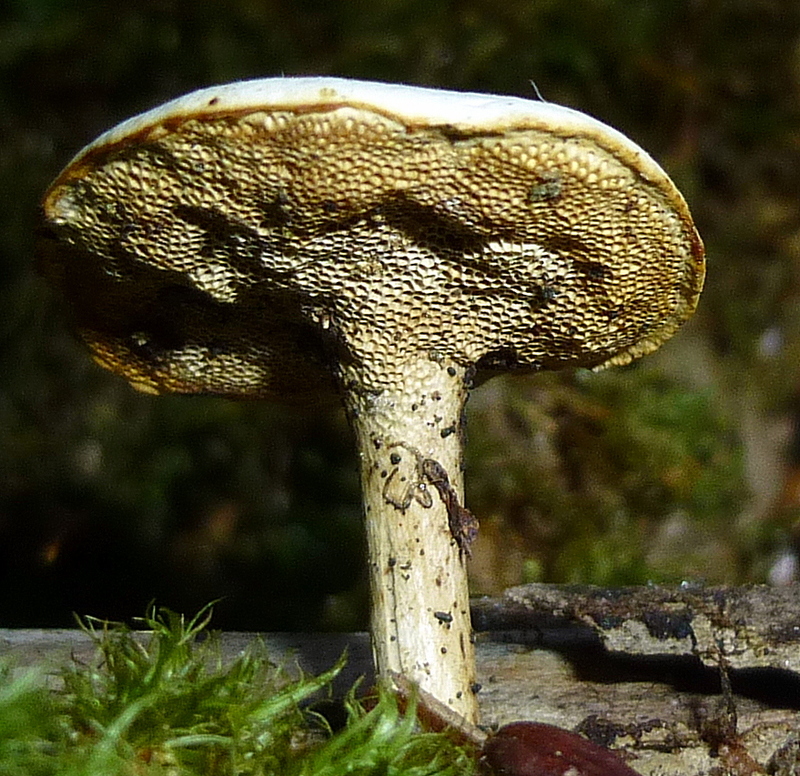 Mushrooms with pores instead of gills are called boletes. 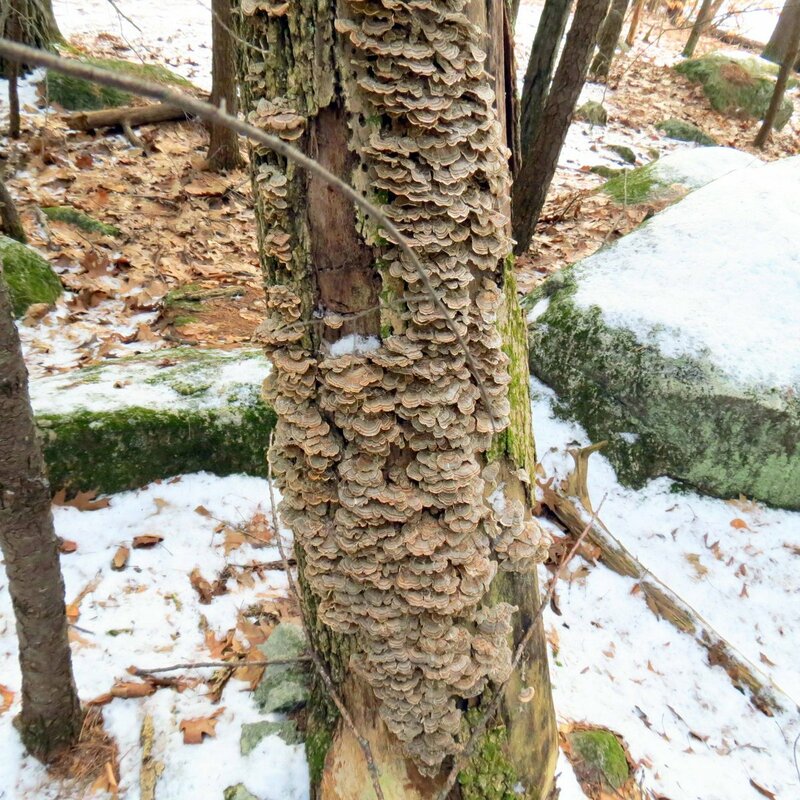 If a shelf or bracket fungus has pores it is called a polypore. Broom Moss (Dicranum scoparium) is a North American native that grows on soil, stones or logs, but I usually find it on the ground in semi shaded places that don’t get strong sunlight. 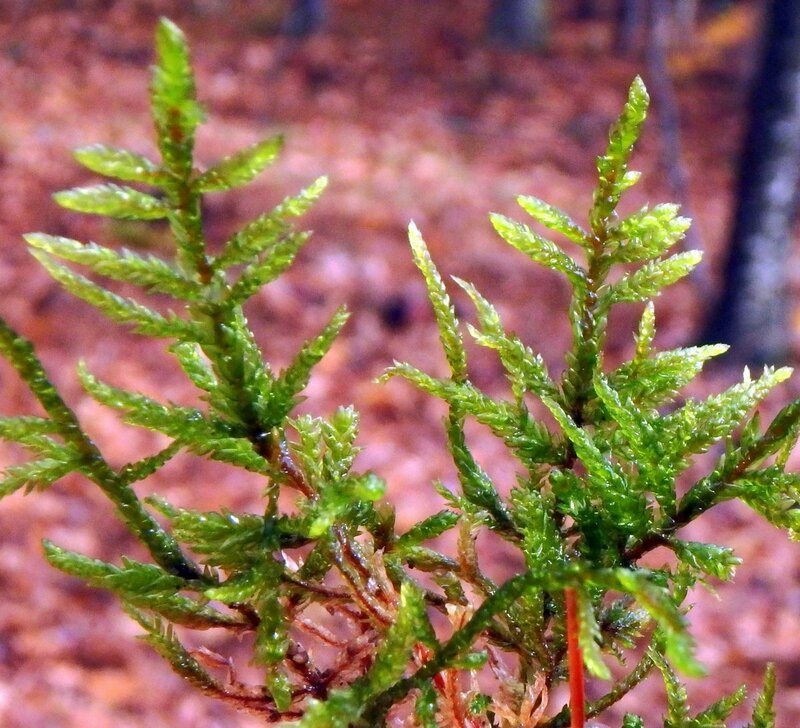 The scoparium part of the scientific name comes from the Latin scopae, which means “broom” and the common name broom moss comes from the way that all of the curved leaf tips point in the same direction, looking as if someone swept them with a broom. Scopae also describes the brush like hairs used to collect pollen that are found on the abdomens and legs of some bees. 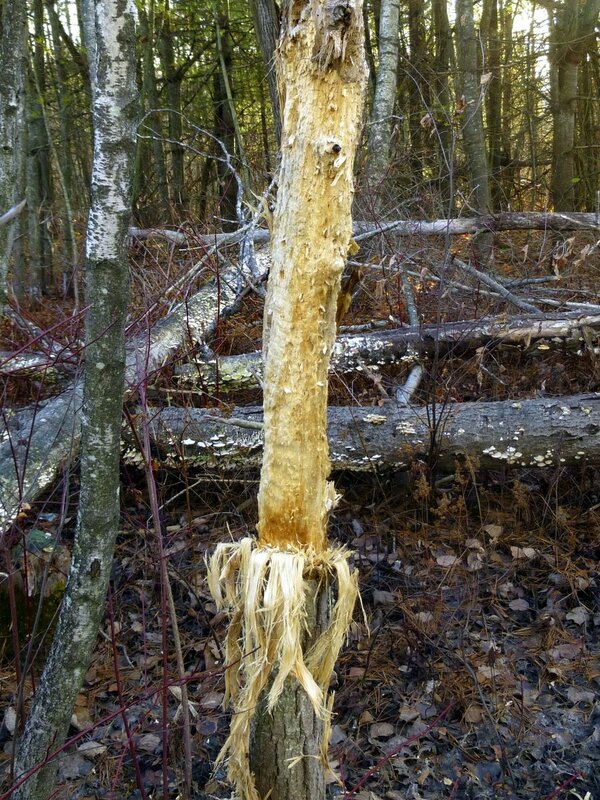 When you come upon a tree that looks like this in the forest you might think that a bear had gone after it, but this damage was caused by a woodpecker-a Pileated woodpecker, to be exact. 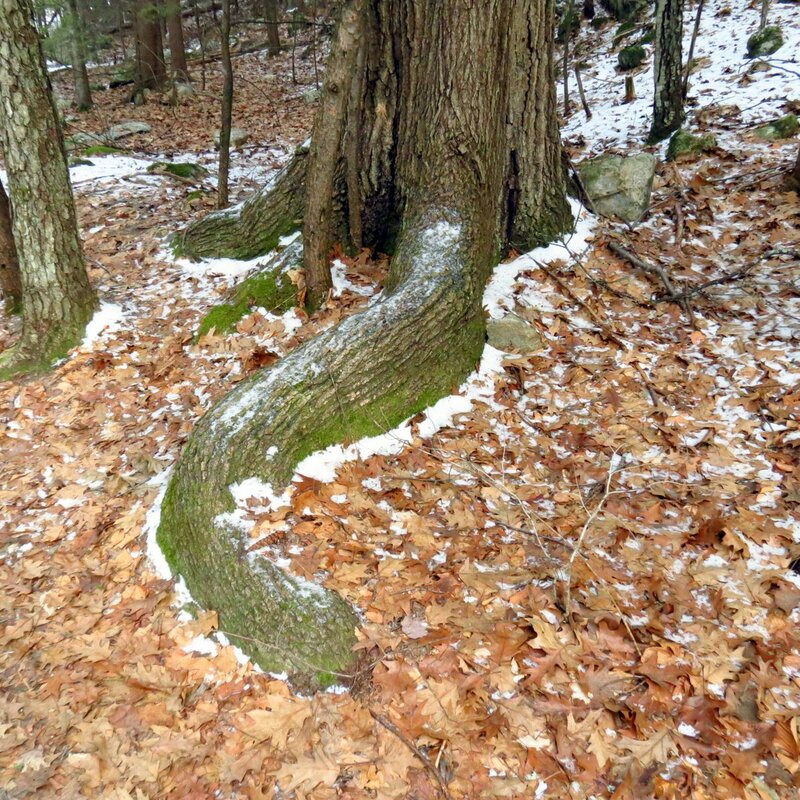 I see trees that look like this all of the time, and have even seen trees cut in half with their top on the ground. I wish I had gotten the large pile of woodchips at the base of the tree in this photo, but I wasn’t thinking. 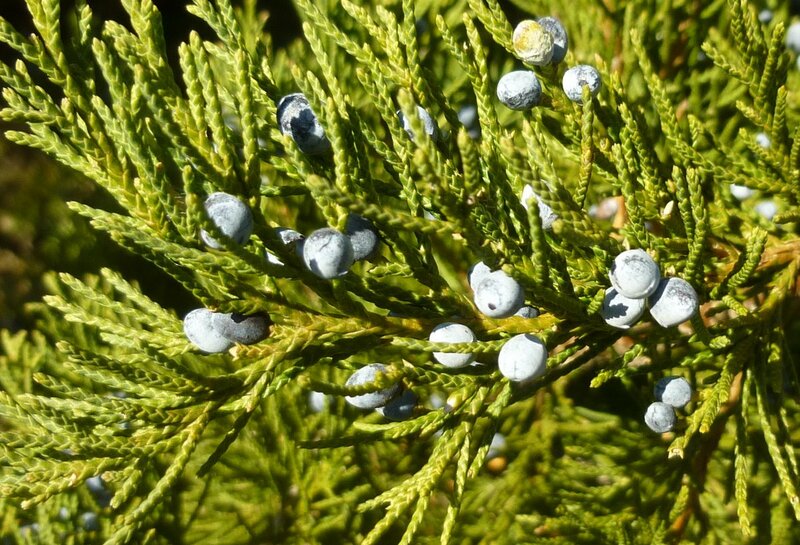 The fruit of an Eastern juniper (Juniperus virginiana) looks like a berry but it is actually a soft, fleshy cone. They are a deep, bluish purple color but are covered with a white wax coating that makes them appear lighter blue. 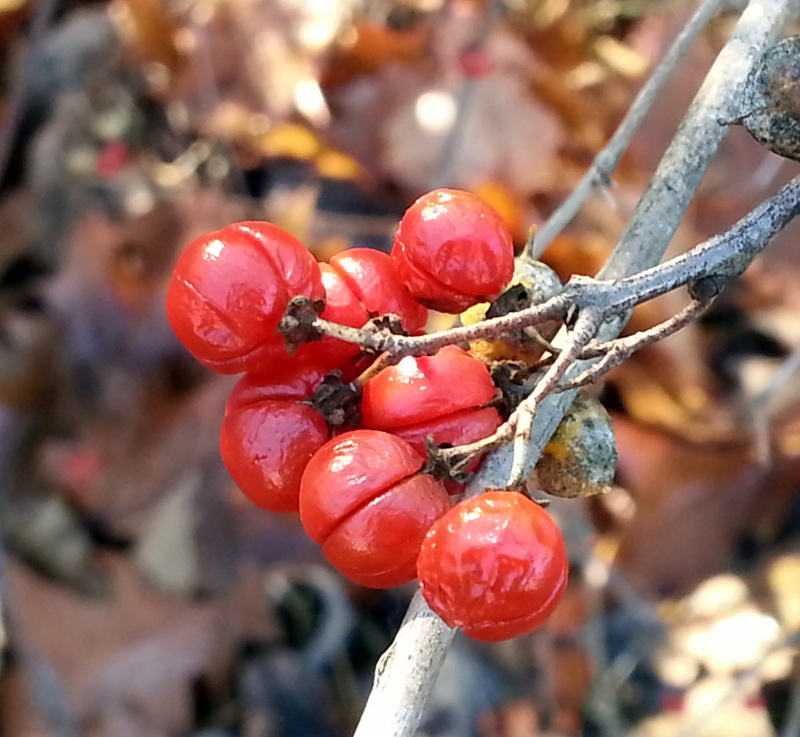 The most common uses for the “berries” are as flavoring for cooked game or to flavor gin. Native Americans used them medicinally and in food. 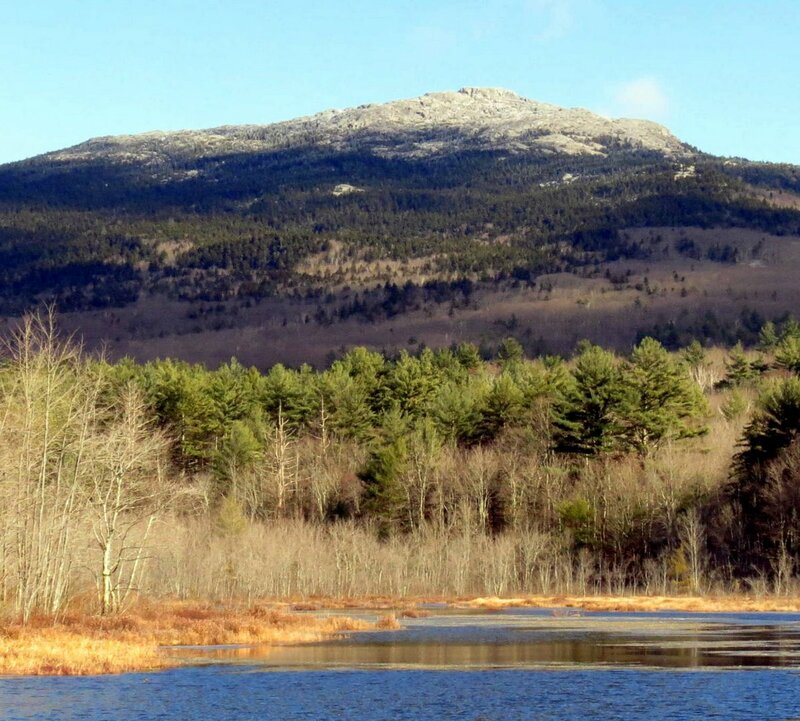 Mount Monadnock has had its first snowfall, though the bright sunshine almost hides that fact in this photo. 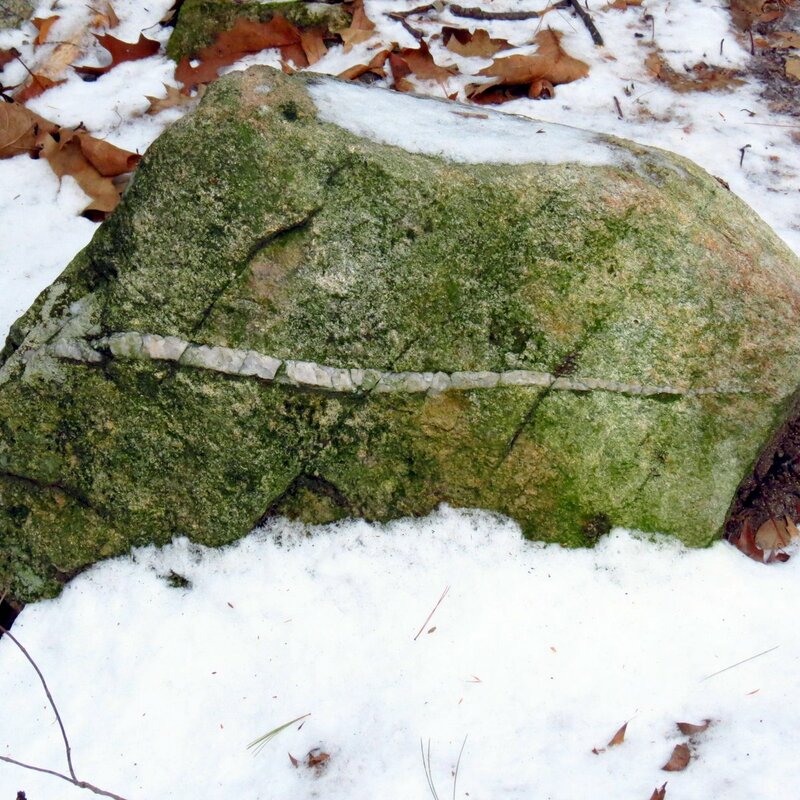 Once the snow really starts to fly bare granite won’t be seen up there again until late spring. 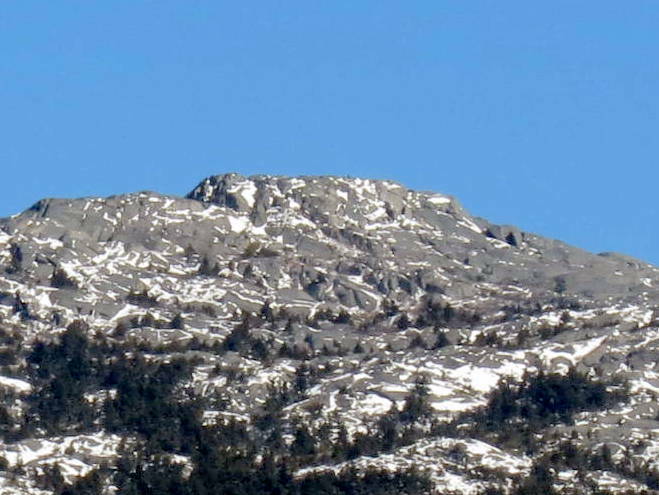 I decided to climb to the summit one warm April day years ago and had to wade / crawl through waist deep snow. By the time I made it back down several hours later I looked like I had been swimming with my clothes on and even had to pour water out of my wallet and shoes. Climbing with no snowshoes was a foolish and dangerous thing to do, but at 18 I wasn’t always the sharpest knife in the drawer. 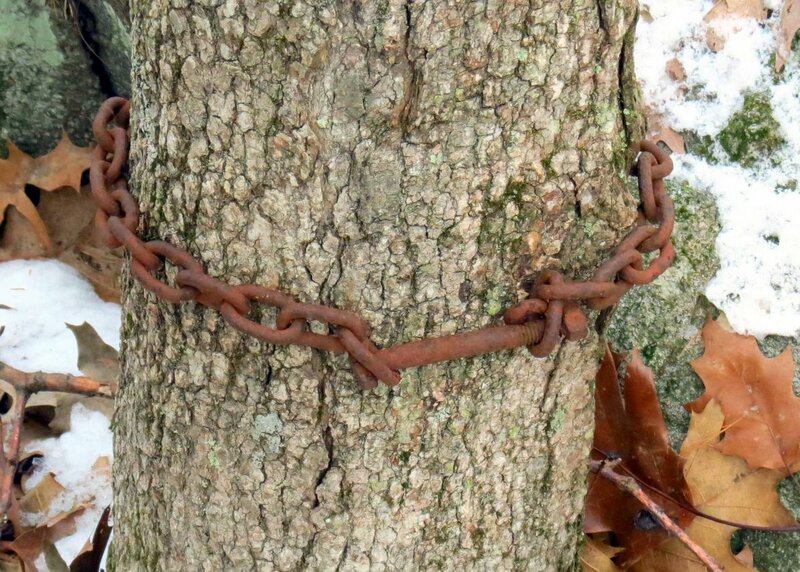 This post is another full of those interesting and sometimes strange things that I’ve seen in my travels through the woods. 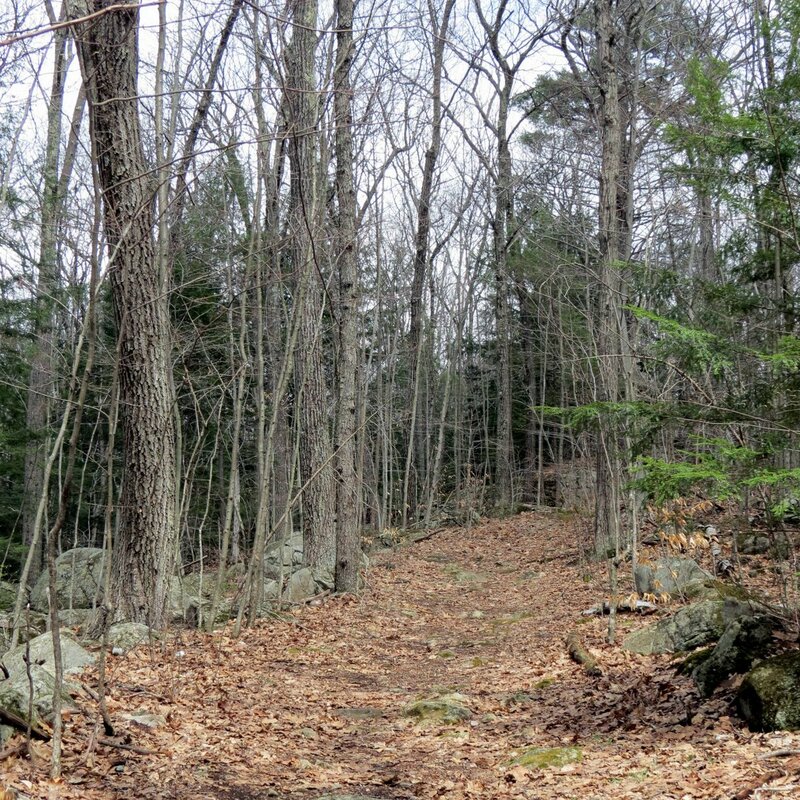 The trails are much easier to negotiate these days. 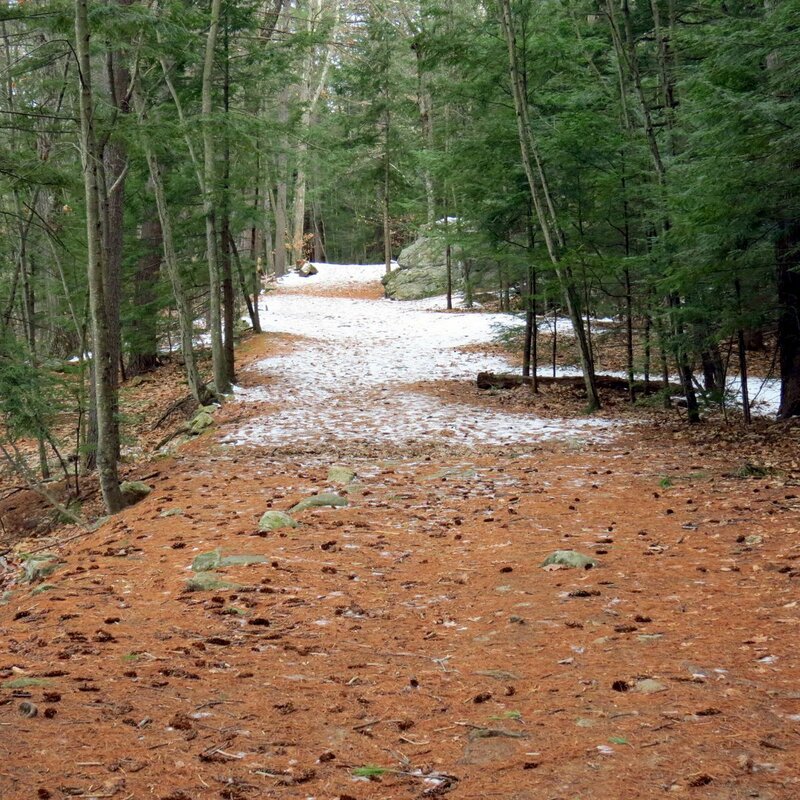 Just a short time ago there was so much snow here that snowshoes were needed. 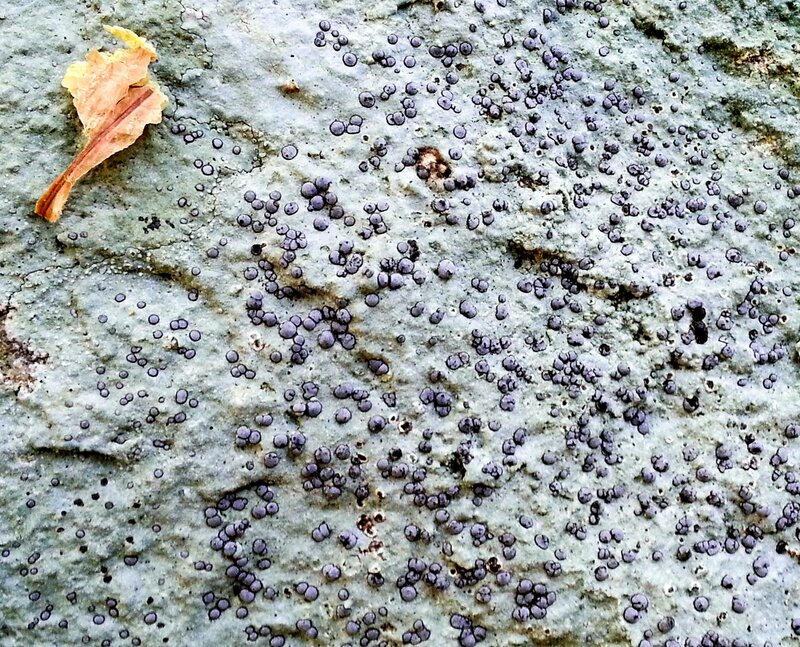 I came upon some bubblegum lichen (Icmadophila ericetorum) a while ago. 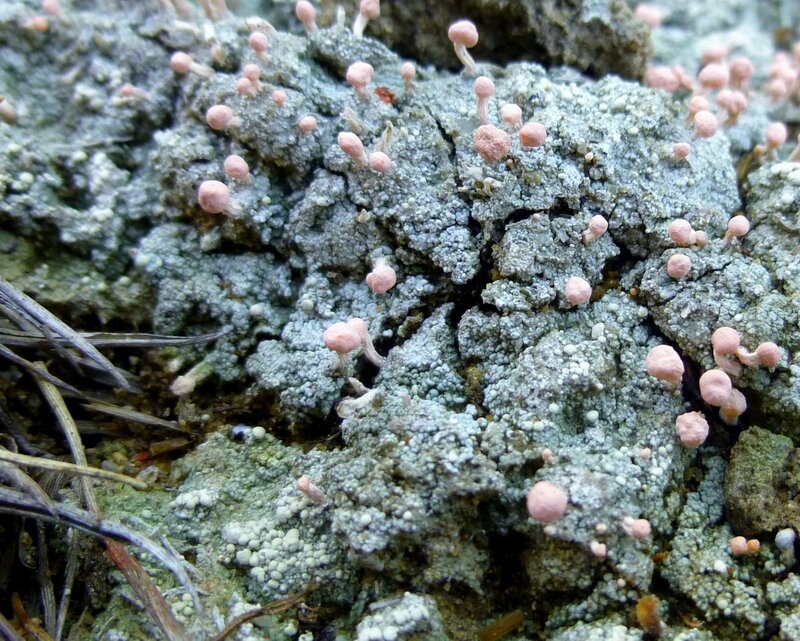 This lichen gets its name from the bubble gum pink fruiting bodies. 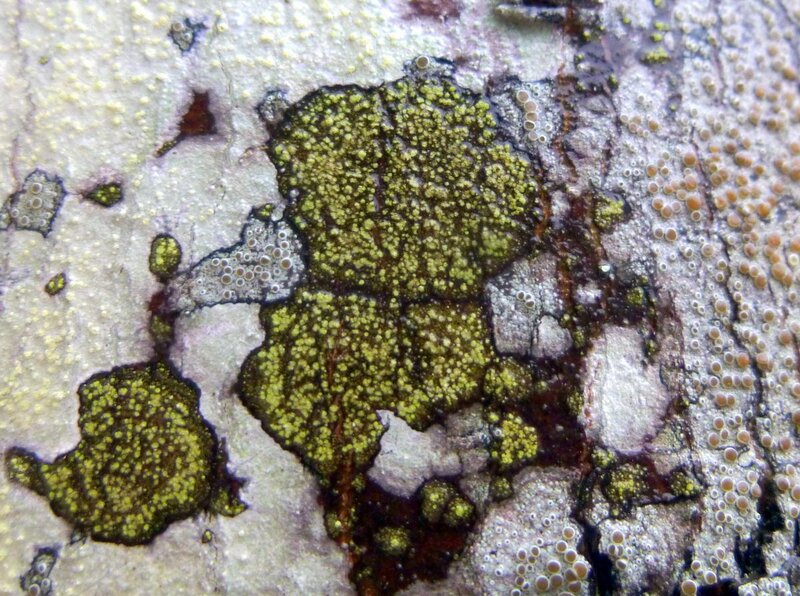 They really stand out against the light blue body of the lichen-even for someone as colorblind as I am. 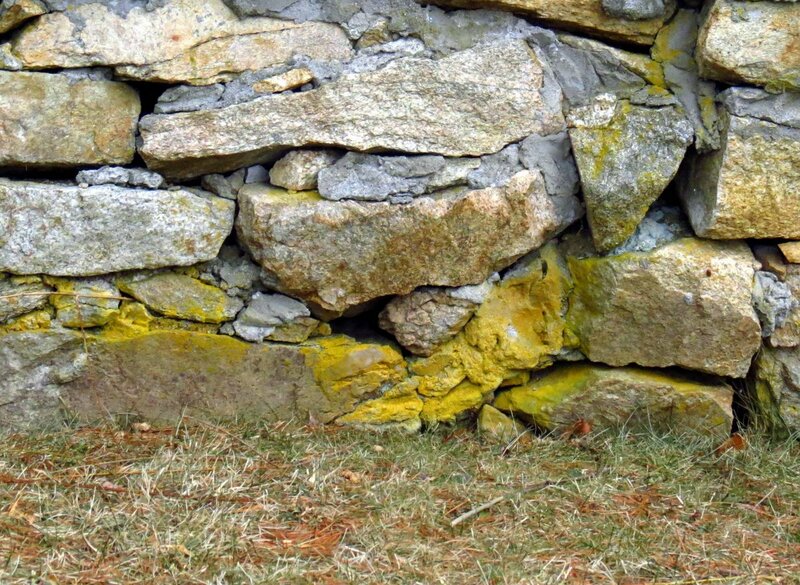 This lichen likes dry, very acidic soil. I often find it growing near blueberry bushes. 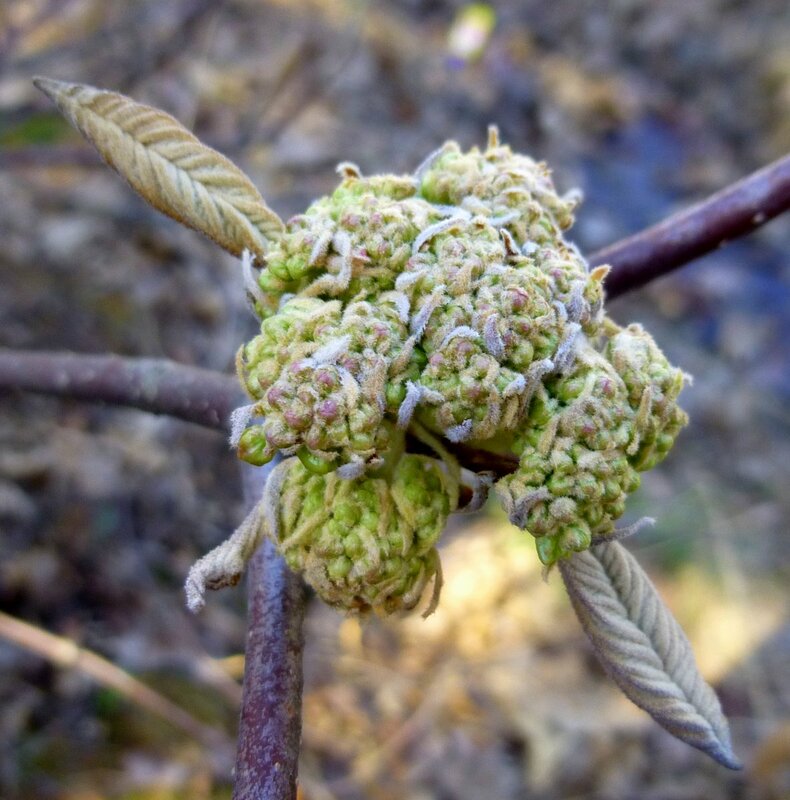 The naked flower buds of hobblebush (Viburnum lantanoides) have grown large since the last time I checked on them. We should see the beautiful white blossoms within the next two weeks, I’d guess. This is one of my favorite viburnums. Regular readers of this blog know that they won’t see many bird or animal pictures here, but occasionally one will pose for me like this bird did recently. 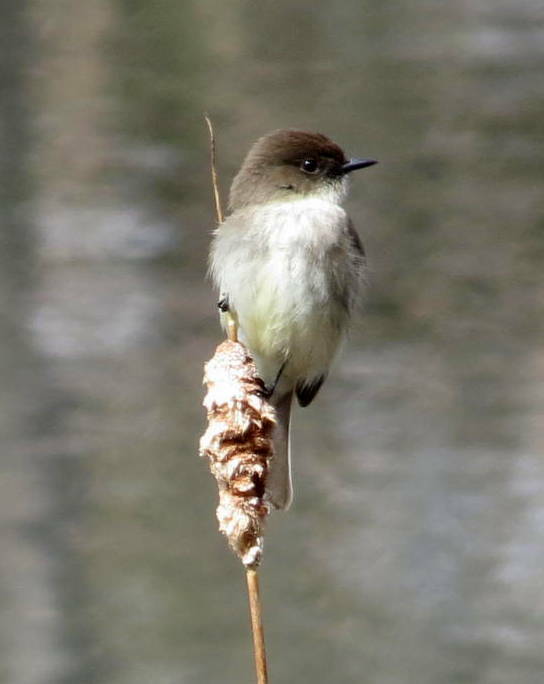 I have a blurry side view that leads me to believe it is an eastern phoebe. Usually color blindness lets birds and animals blend right into the background when I try to find them, and that’s why I don’t spend a lot of time trying to photograph them. This day there were several of these little flycatchers darting among the cattails at a local pond, and that made them much easier to see. 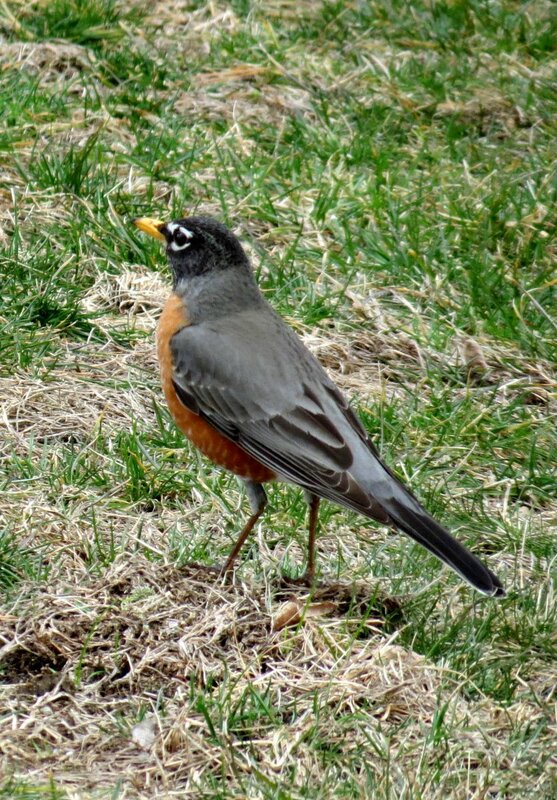 This robin was bobbing along beside a road I was walking on. It seemed important for him to stay just slightly ahead of me, so we played the game of me trying to catch up to him for a while before he flew off. Oriental bittersweet (Celastrus orbiculatus) tried to strangle this tree but the tree grew out over the vine and enveloped it, choking it off instead. Oriental bittersweet was intentionally imported to help with erosion control. Almost immediately, it escaped and began trying to take over the U.S. Once established it is very hard eradicate. This example of an oriental bittersweet was as big as my wrist and like an anaconda, had slowly strangled the life out of the tree it climbed on. 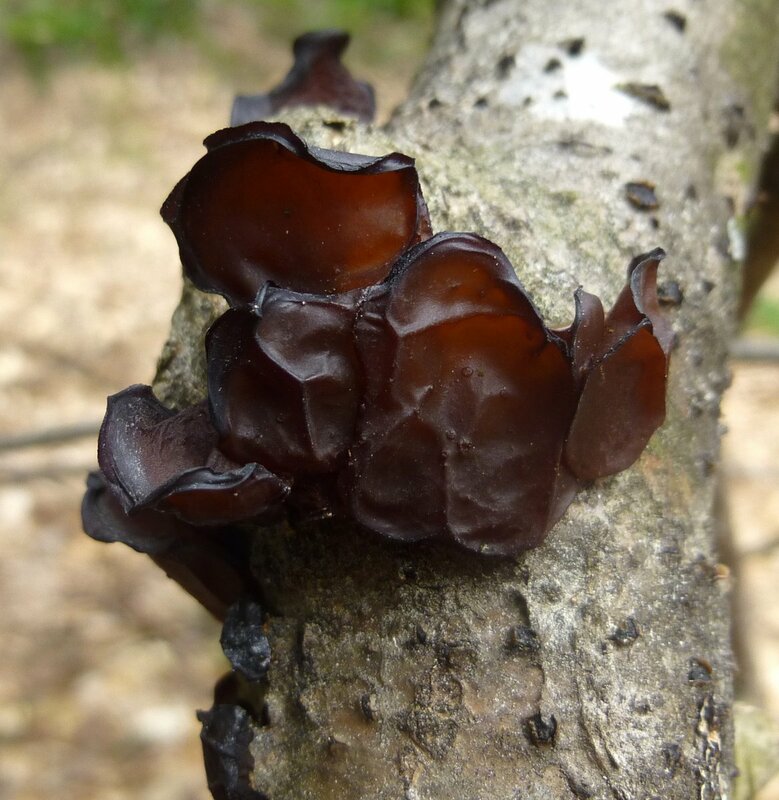 Jelly fungi like this amber one (Exidia recisa) seem to be much more plentiful in winter and spring rather than in summer. 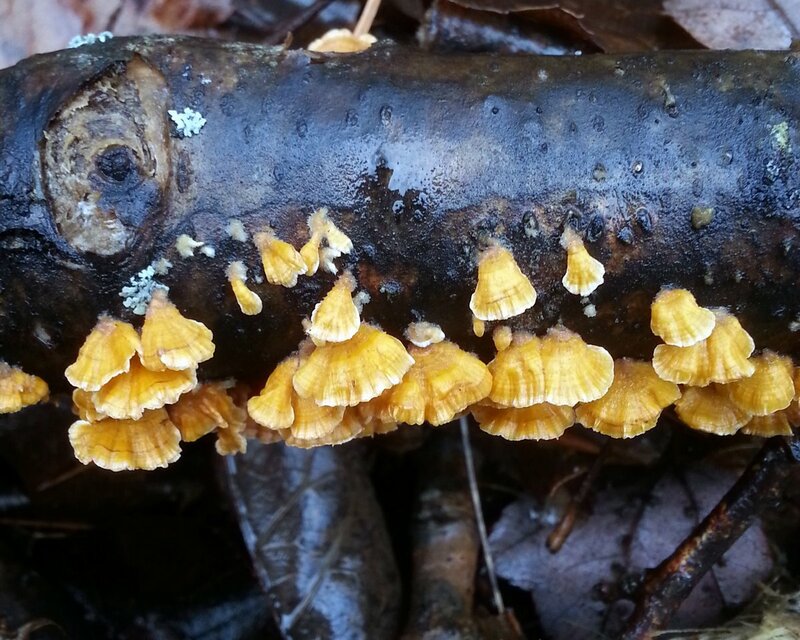 Common names for this fungus include willow brain fungus and amber jelly roll. It always reminds me of canned cranberry jelly. 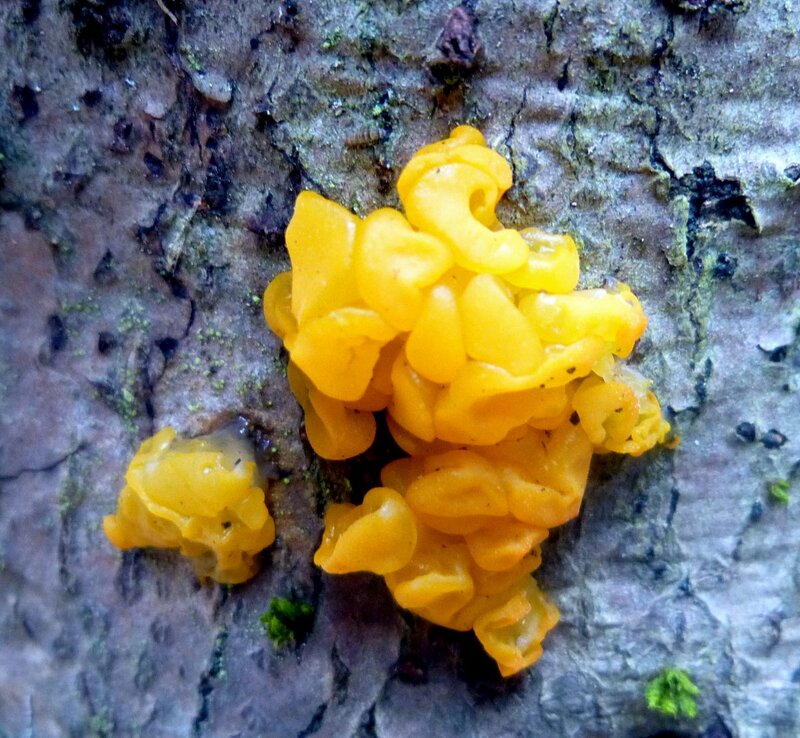 Yellow jelly fungi (Tremella aurantia) seem more plentiful in the warmer months. I’ve just started seeing them in the woods again after its being absent for most of the winter. Common names for the fungus in the photo include golden ear fungus. It is very similar to yellow witch’s butter (Tremella mesenterica) but has a matte finish rather than a shiny, wet looking finish. It also seems to more closely resemble a brain. 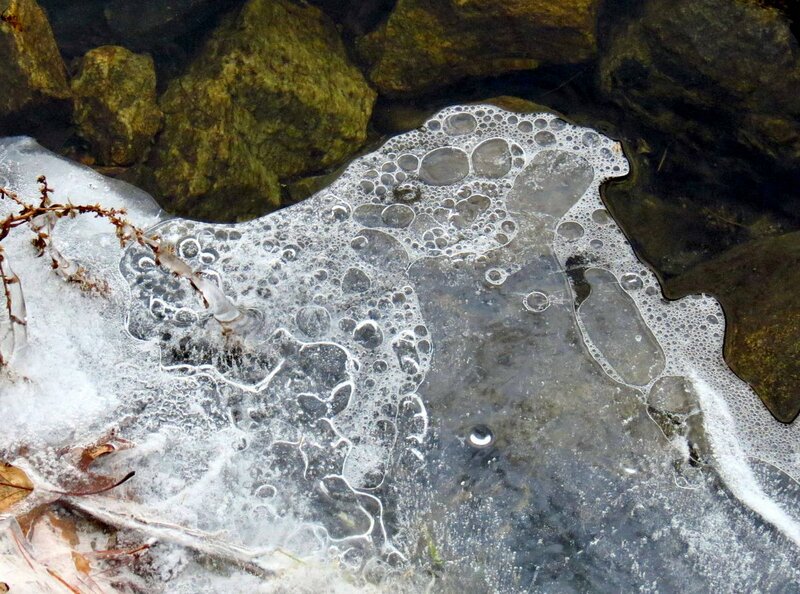 Weeks after seeing the book Photographing Patterns in Nature I’m still finding patterns everywhere. 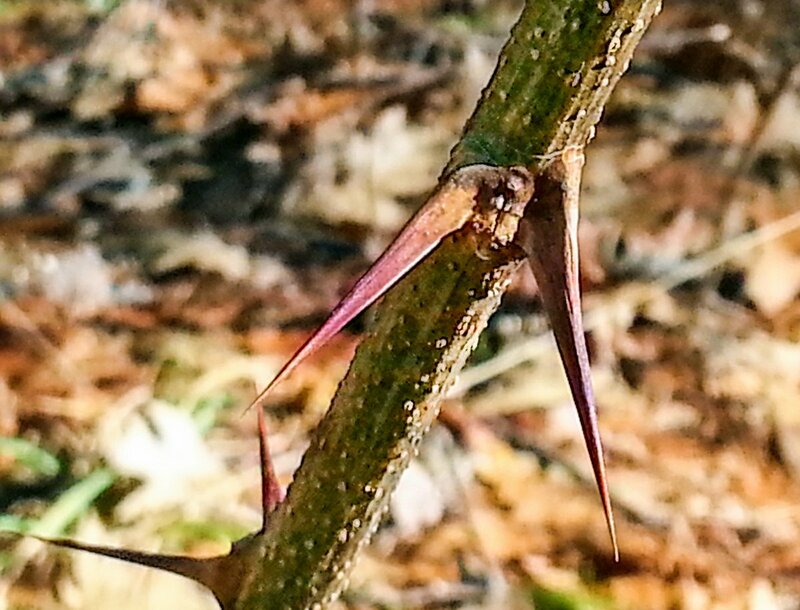 I like the chevron patterns on these small oak buds. 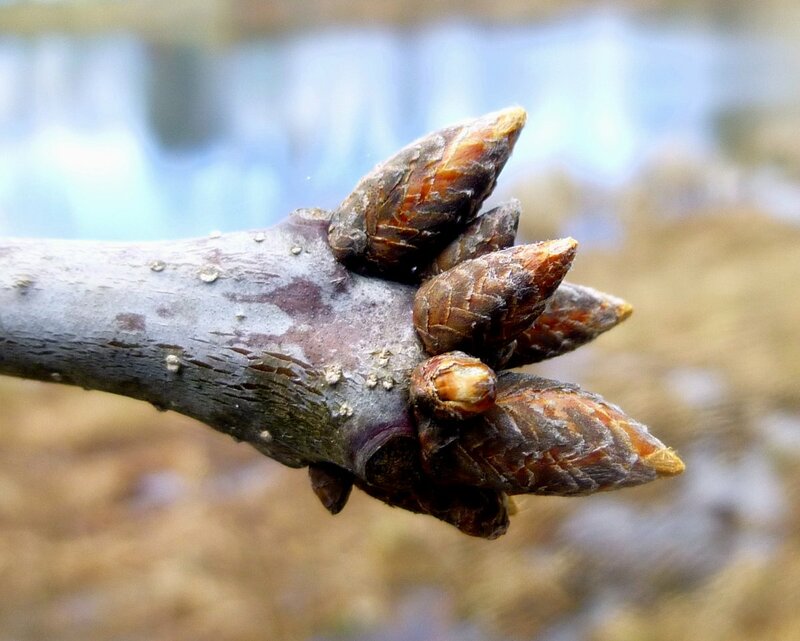 I think these were on a black oak (Fagaceae Quercus.) 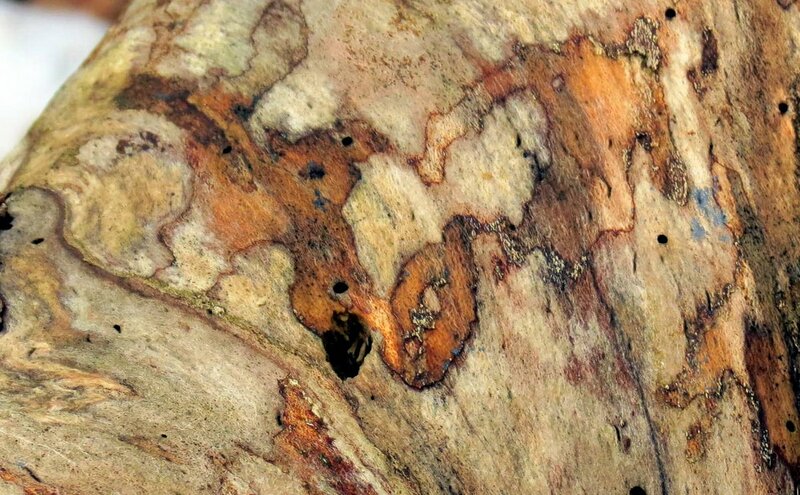 I could have verified this by looking at the inner bark, which is a light orange color, but I didn’t have a knife. 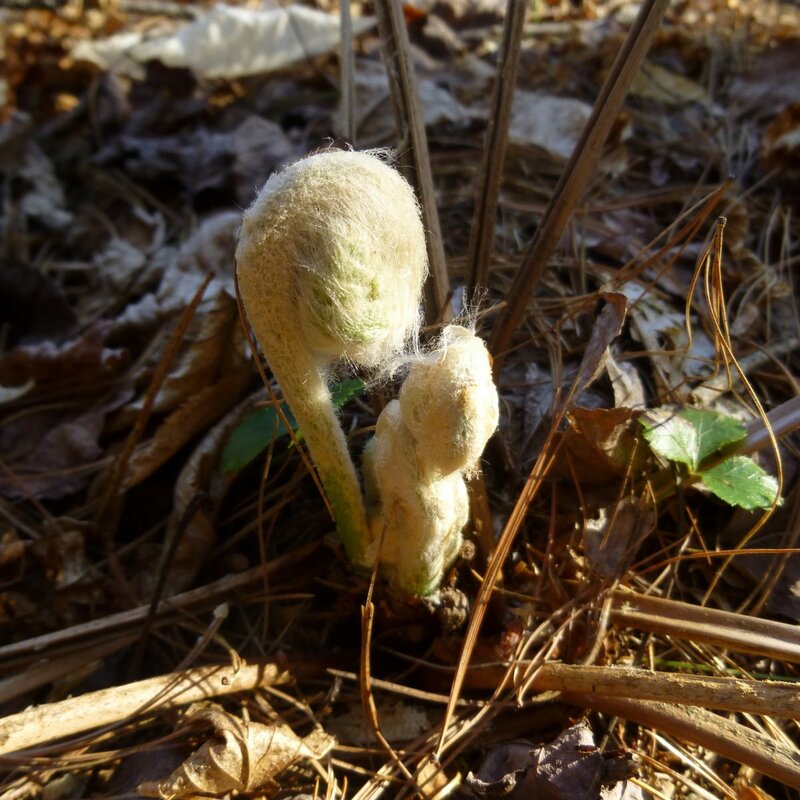 Cinnamon ferns (Osmunda cinnamomea) have fuzzy fiddleheads. They look like they’ve been wrapped in wool but deer don’t mind-they will eat all they can find. This fern gets its common name from its fruiting fronds that turn a cinnamon color after starting life bright green. These fiddleheads stood about 3 inches tall and are the first I’ve seen this spring. I loved the figural grain patterns on this log and wished that I could take it home and make a desk or table from it. Who wouldn’t want to be able to see such beautiful wood each day? It isn’t often that I see sedges flowering, so I was happy to see this one. Its grass like leaves, purple bracts and relatively large male staminate flowers at the end of the stalk tell me this plant is one of the carex sedges. Once I got home and looked at the photo I was even happier to see the shiny leaves of broom moss (Dicranium scoparium) in the background. 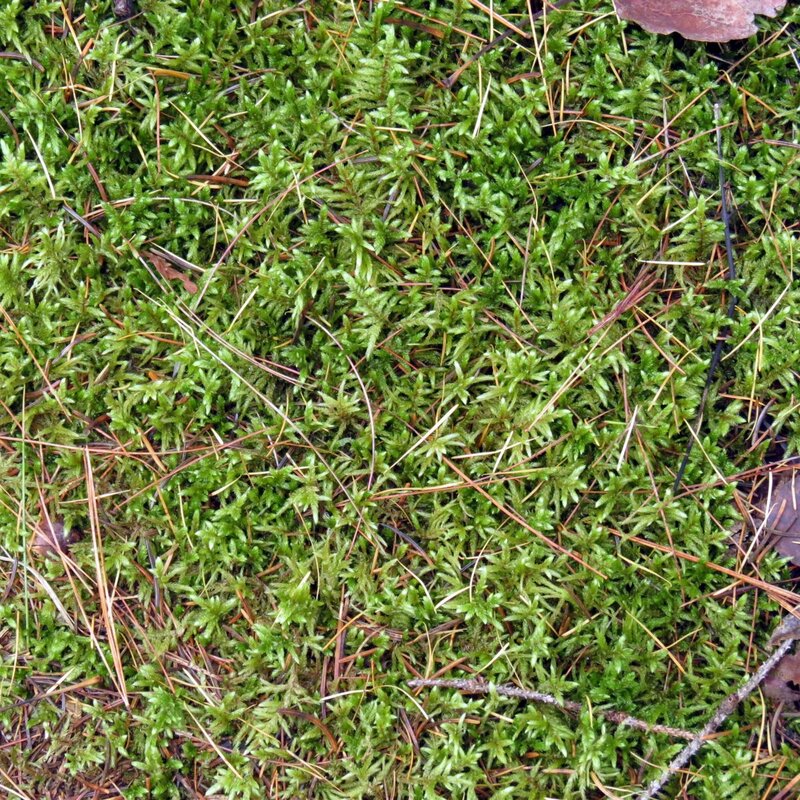 This moss is one of the easiest to identify because of its grass green leaves. They taper from base to tip and also curve in a continuous arc. Another common name is wind swept moss because of the way that the leaves all appear to be pointing in the same general direction. 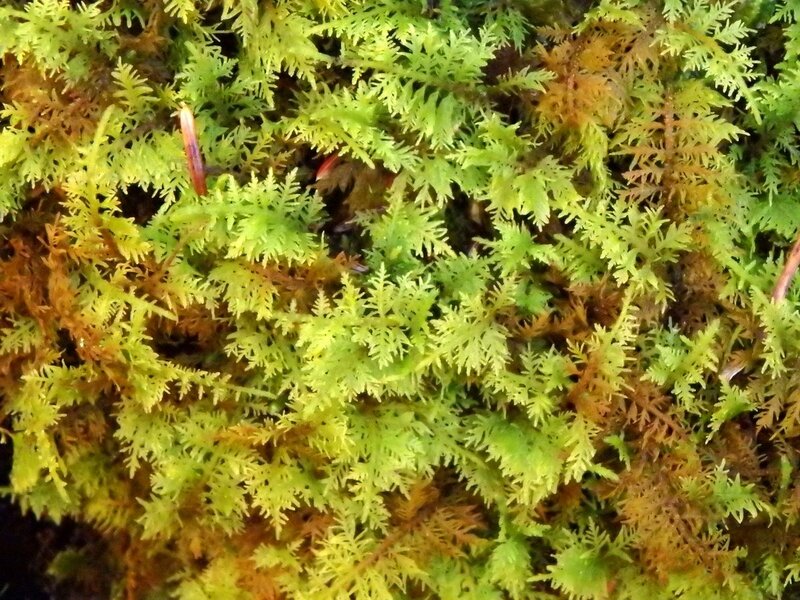 It is, I think, one of the most beautiful mosses.